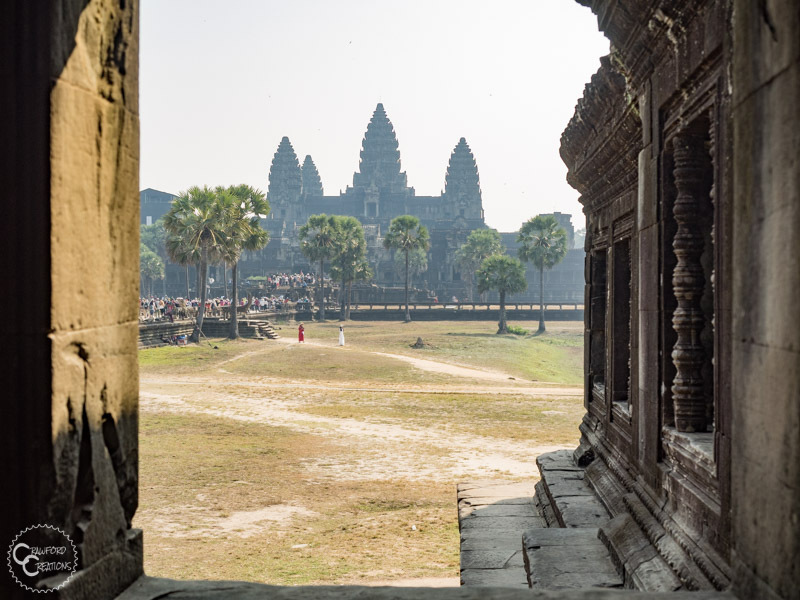 In Angkor Wat lies Cambodia’s crowning jewel, its claim to fame. 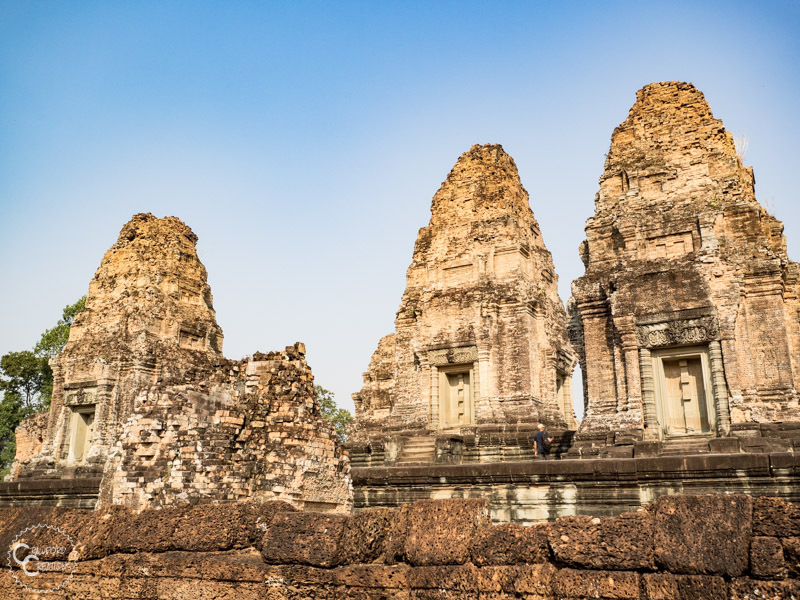 The temples are known around the world and have become as much of a national symbol as the Eiffel Tower and Great Wall. And rightly so. 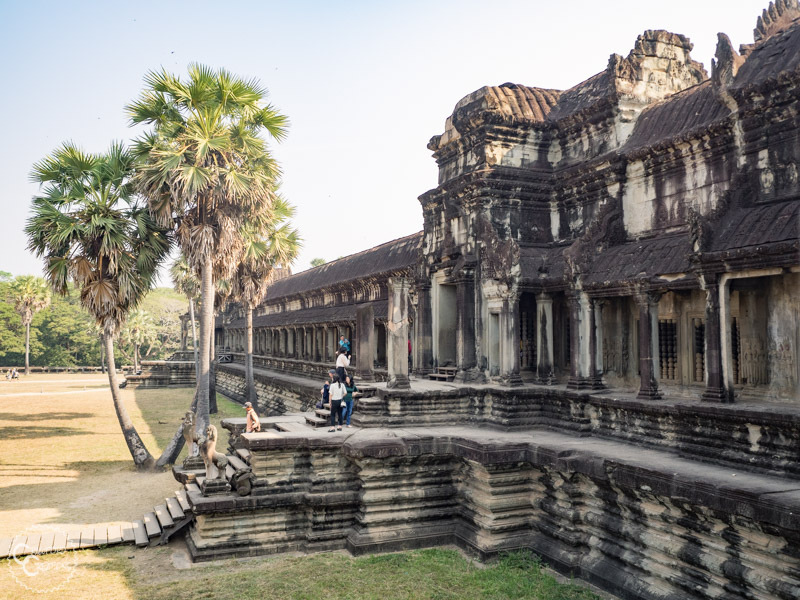 Covering an area of 400 square kilometers and containing over 1000 temples, Angkor Wat is a marvelous feat of engineering and artwork. 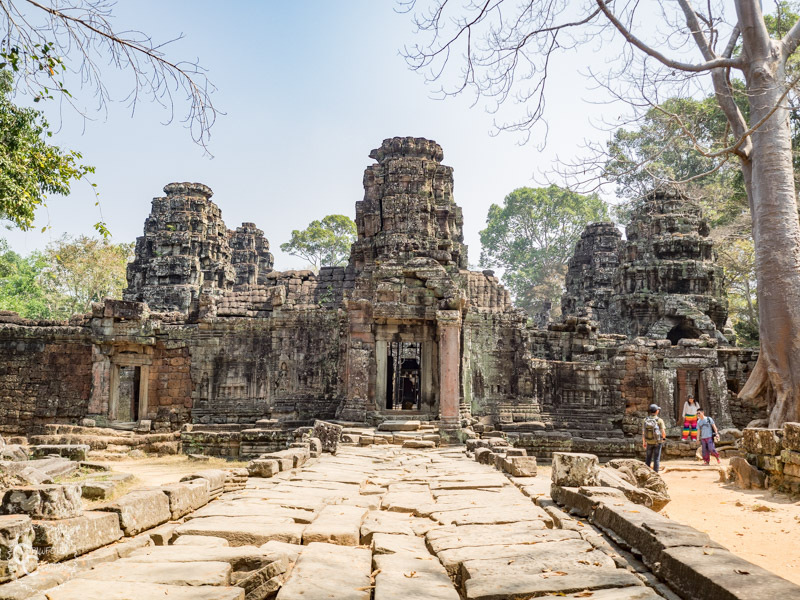 In its prime, from the 9th to the 15th century, the city was home to over 1 million people and functioned as the capital of Cambodia. 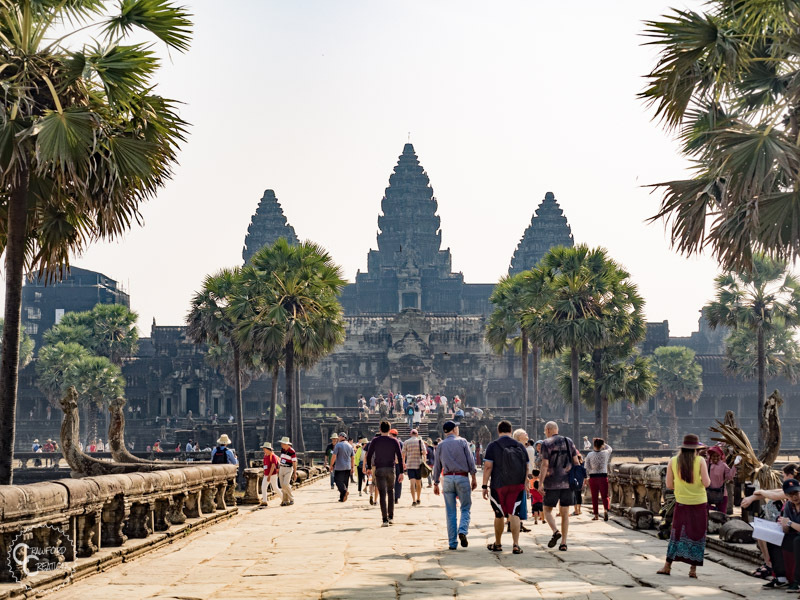 Of the city’s 1000 temples, its namesake, Angkor Wat, holds the title of “largest religious monument in the world” measuring in at 162 hectares or 402 acres. 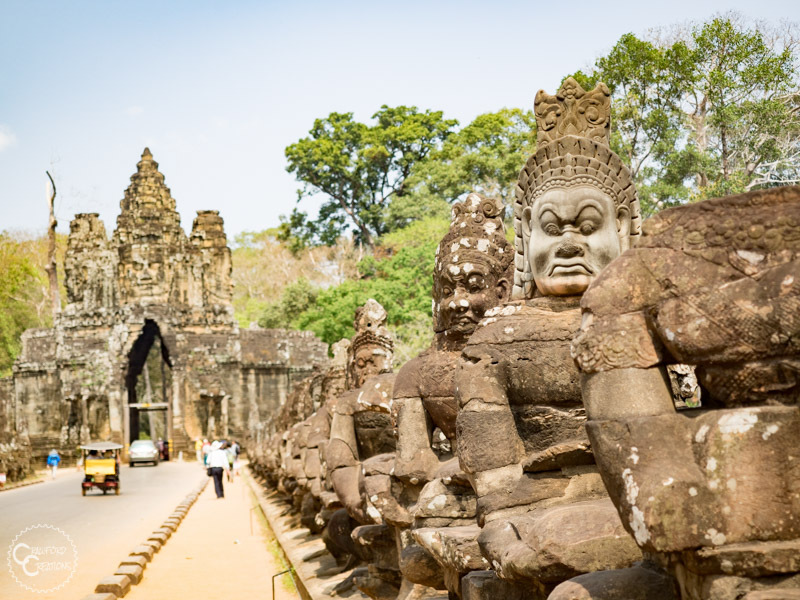 The temples of Angkor Wat were declared a UNESCO World Heritage Site in 1992 under the name Angkor Archaeological Park. 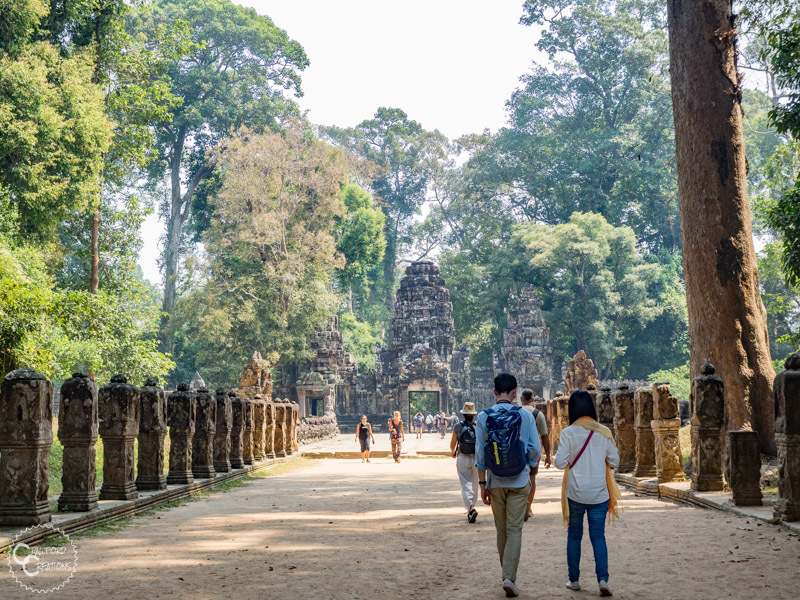 Today, the park brings in the majority of Cambodia’s tourism, popularized, no doubt, with the help of famous actress Angelina Jolie’s hit movie Tomb Raider, part of which was filmed on site at Angkor Wat. 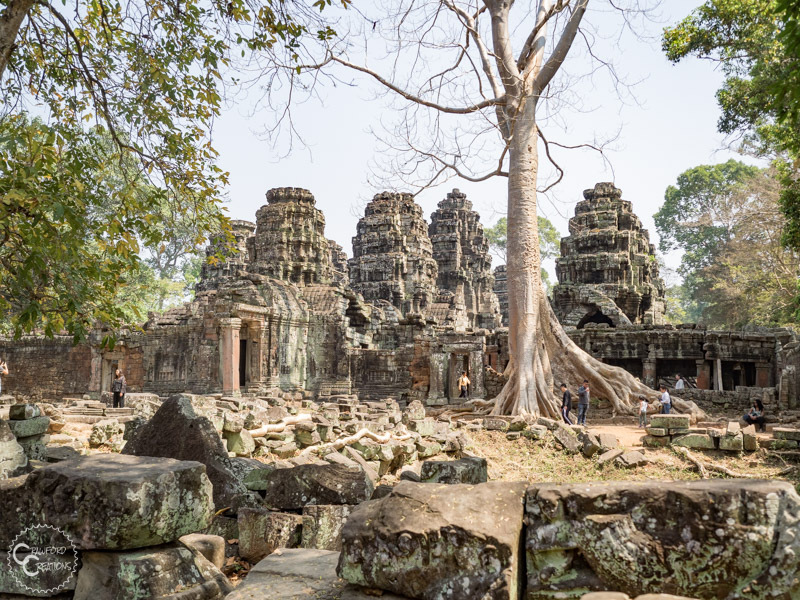 Besides the main attraction of Angkor Wat, the park’s two most touristed temples are the ones featured in the movie, Bayon and Ta Prohm. 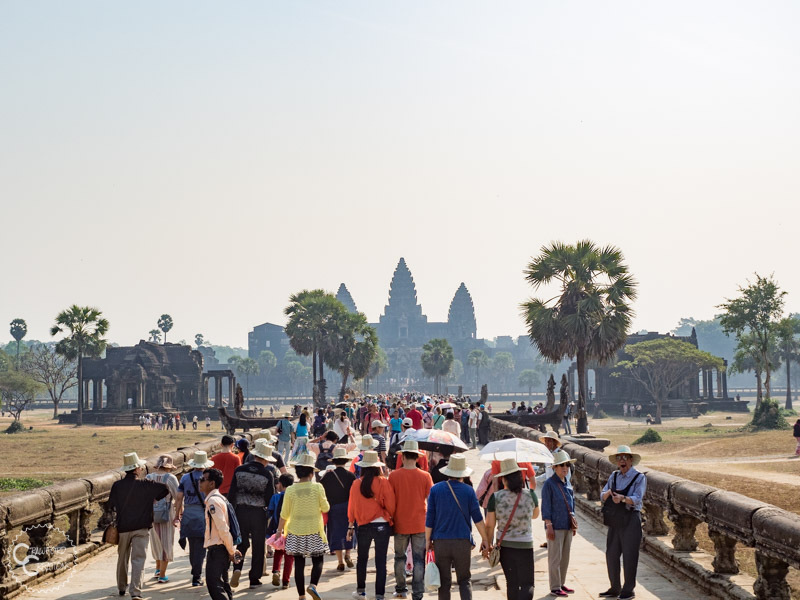 In 2016 alone over 5 million tourists visited Angkor Wat, a number that has only been steadily growing in recent years, and for good reason. 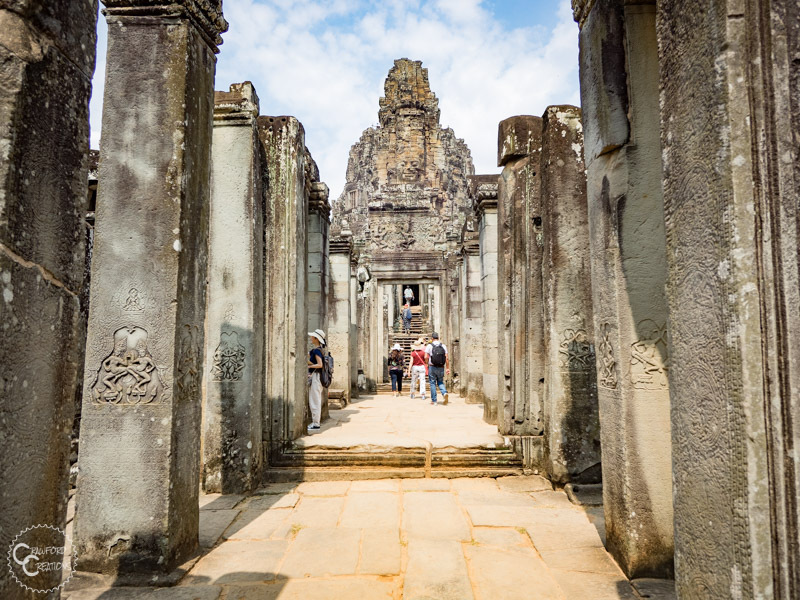 Angkor Wat is truly a work of art, and its popularity is certainly well deserved. 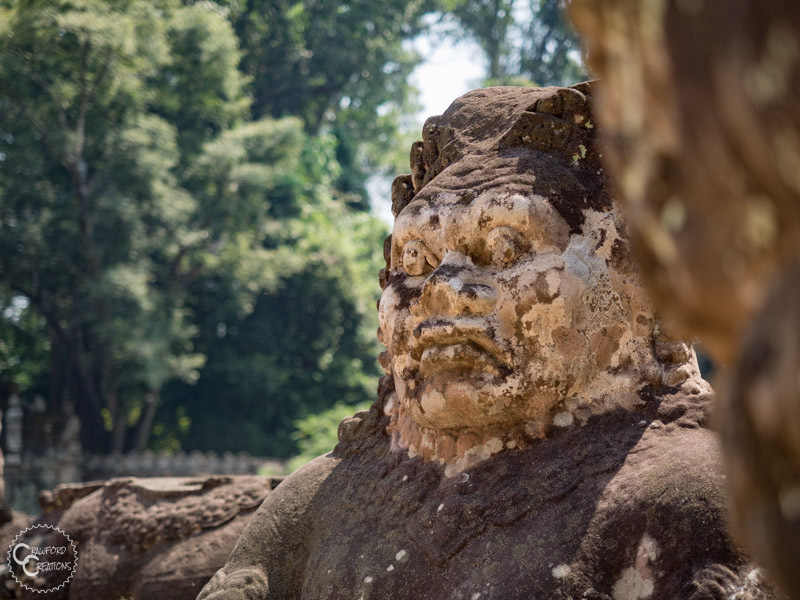 Angkor Archaeological Park is one of those places that is just so incredible I couldn’t put my camera down. Every angle seemed cooler than the last, and every change in perspective more awe-inspiring. 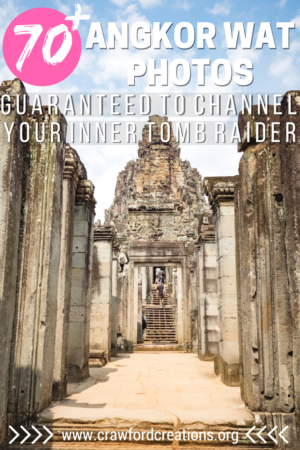 Here are all our best Angkor Wat photos to help you channel your inner Laura Croft and inspire your own Tomb Raider themed adventure. P.S. There are literally 80 photos in this post. I just couldn’t put my camera down. If you make it to the end, I salute you, and you obviously love photos as much as I do, so we should probably be friends, for reals. 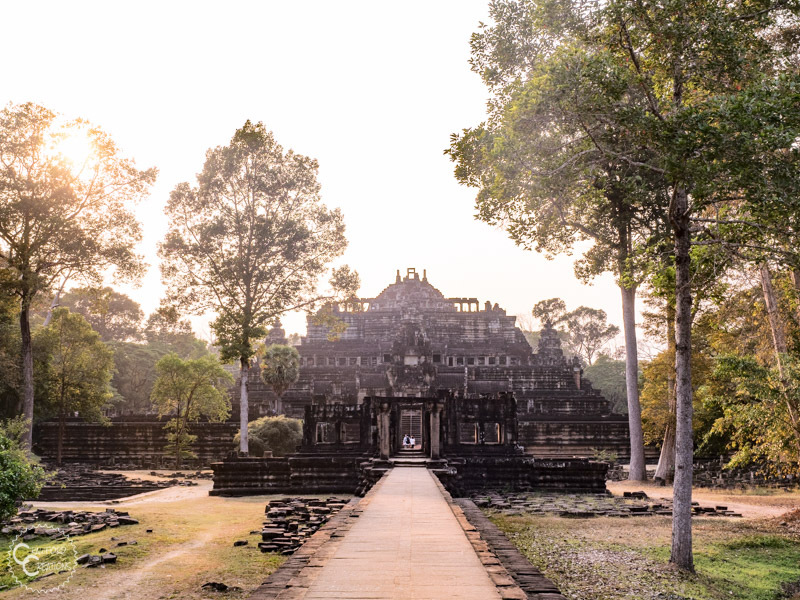 Baksei Cham Krong is the only pyramid shaped temple in all of Angkor Wat, and also one of the few where you can find yourself completely devoid of tourists! Little tip, if you want to climb to the top like I did for this photo, use the stairs on the side. They’re in much better shape than the front set. 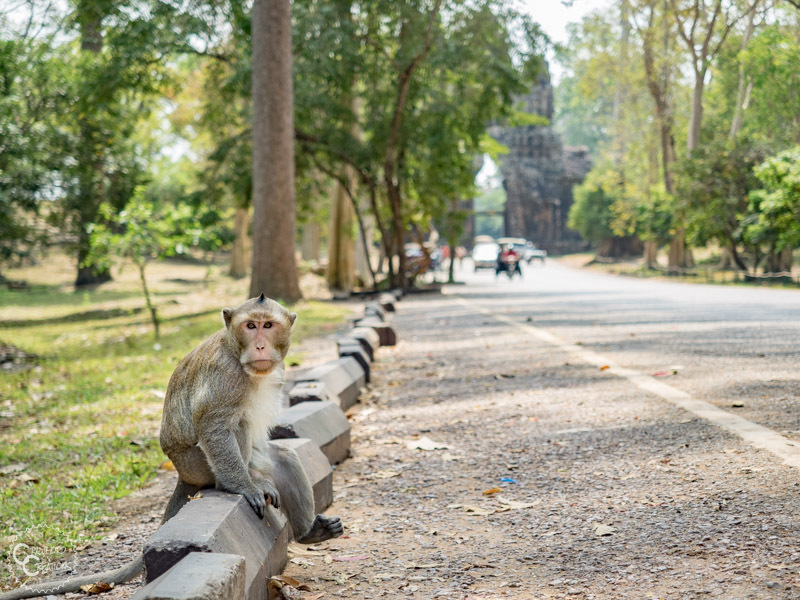 This tiny little guy is located right next to Baksei Cham Krong and also lacks much of any recognition from tourists. Enjoy it. 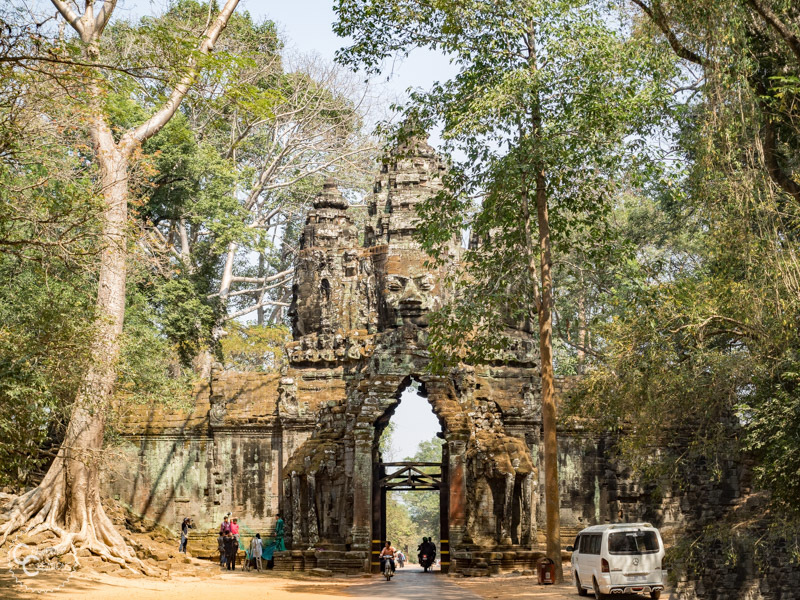 The entrance to Angkor Thom is without a doubt the most photogenic gate I’ve ever seen. Beware of the monkey’s though. They look cute but they’re mischievous little buggers. 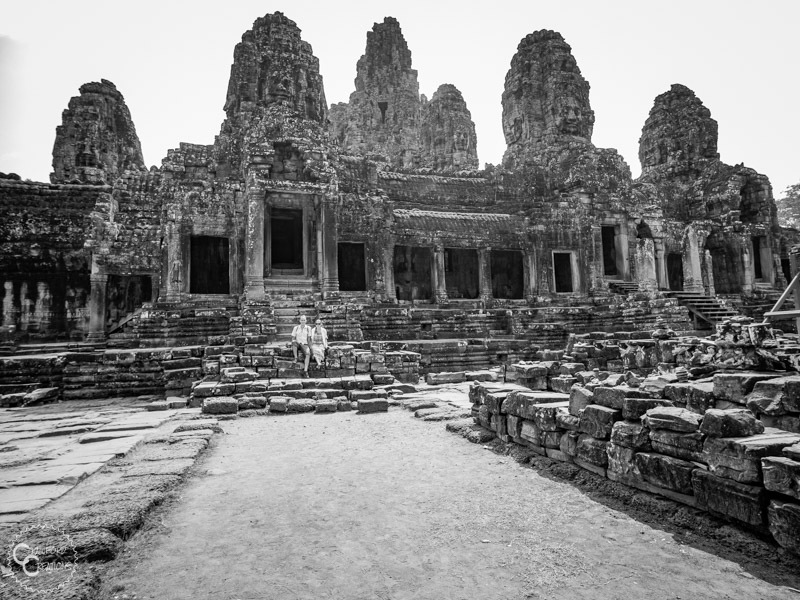 Bayon was the inspiration for the temple that was raided in the movie Tomb Raider. 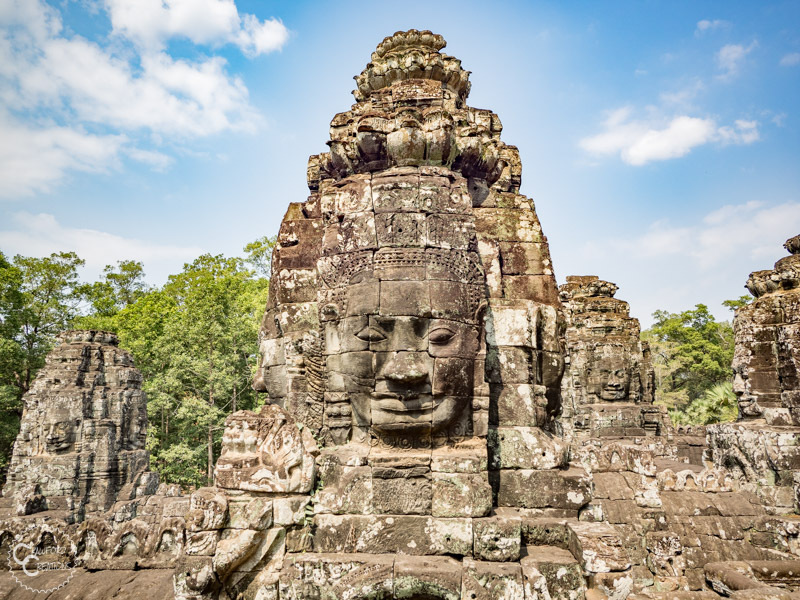 That scene in the movie where the workers are pulling a giant stone face down with ropes to gain access to the inside of the temple was based on Bayon temple. 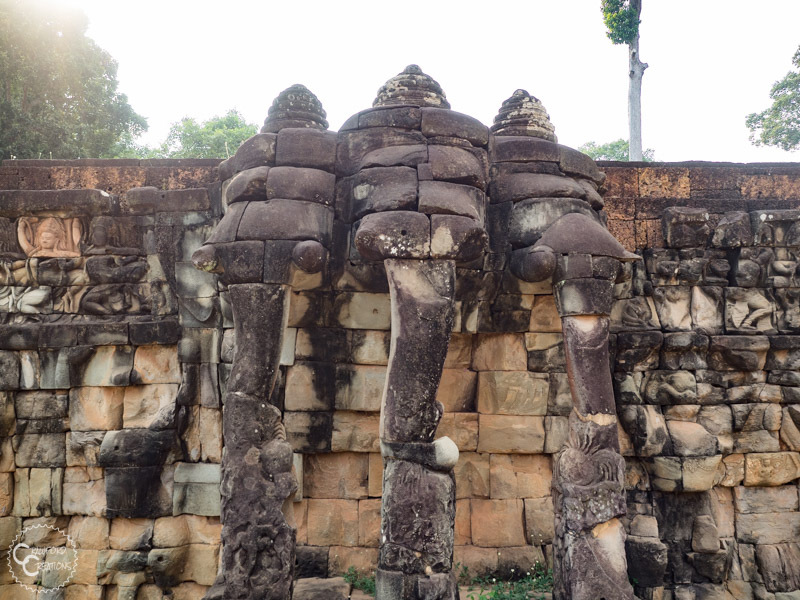 Some visual liberties were taken of course, because at Bayon, all the faces are located up on top of towers instead of on the ground. 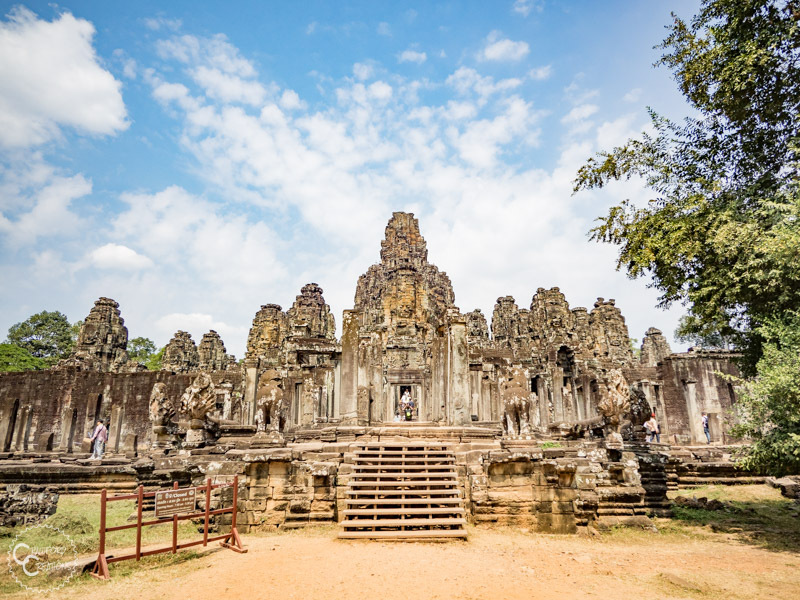 Bayon is one of the largest, and definitely the coolest temple at Angkor Wat, so take your time exploring all the nooks and crannies, and of course, taking photos of those gorgeous faces! Bayon’s most striking feature is its smiling Buddha faces positioned on top of all the towers. They’re so serene, and incredibly well preserved. They just made me want to smile back at them the whole time we explored the temple. I couldn’t stop photographing them. I’ve never seen a stone face so mesmerizing. How did they do that? 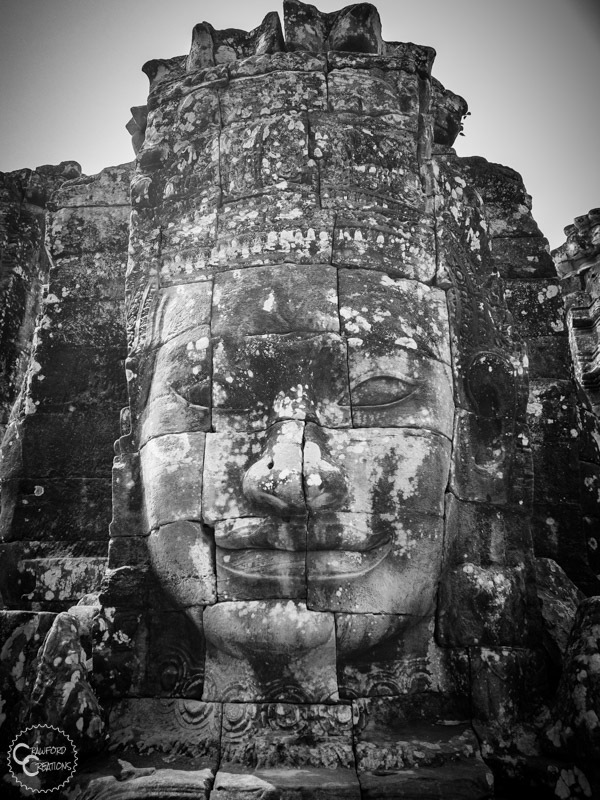 Bayon is made up of 216 stone Buddha faces, all carved in the same contented expression. 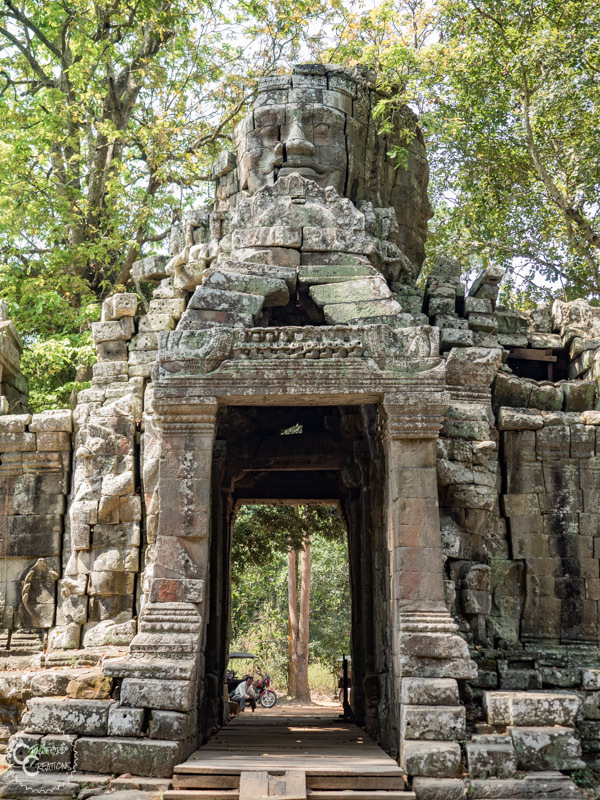 It makes sense when I read that this is the only temple in all of Angkor Wat dedicated completely to Buddha. 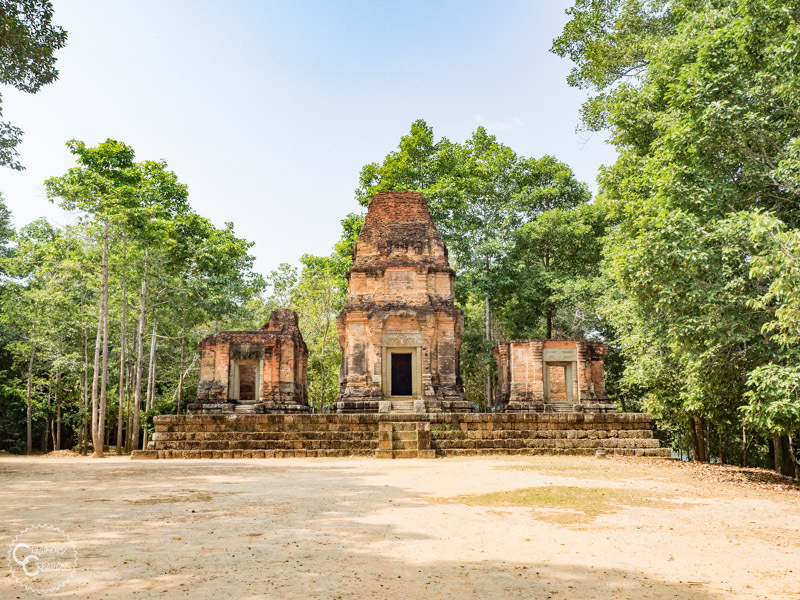 Preah Pithu is a group of small temples located inside of Angkor Thom. 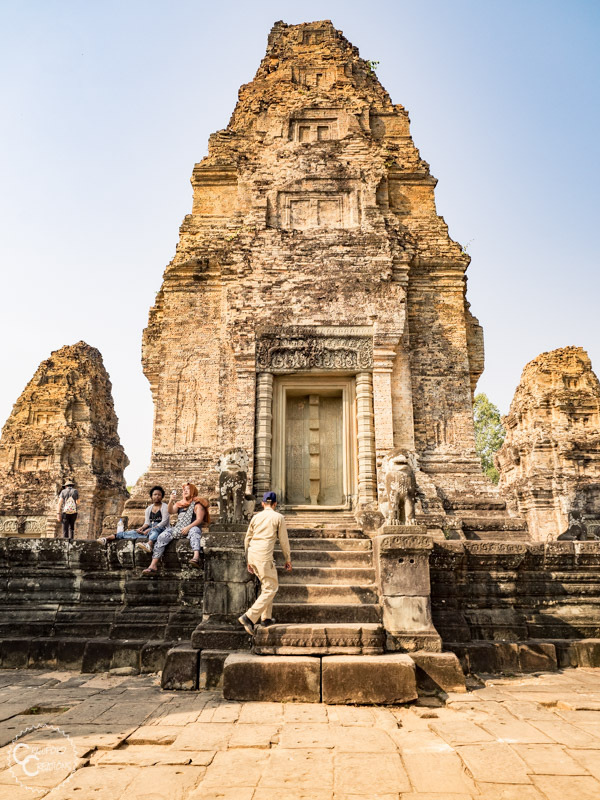 While the smaller temples are not very impressive compared to the likes of Bayon and Preah Khan, they’re where you can really let your adventurous spirit shine. 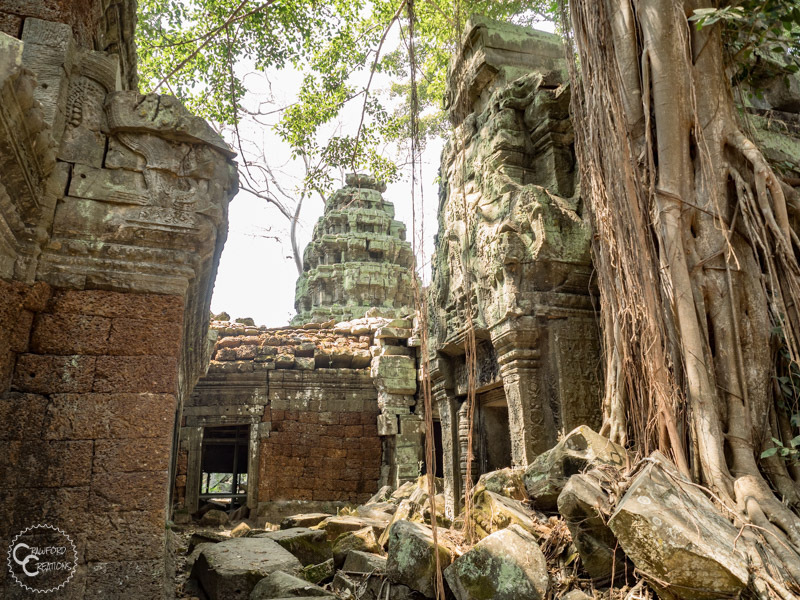 No tourists, no guards, just you, some ruins, and the jungle. Be respectful of where you are, of course, but you can really get into the spirit back here. This place is literally as it sounds. 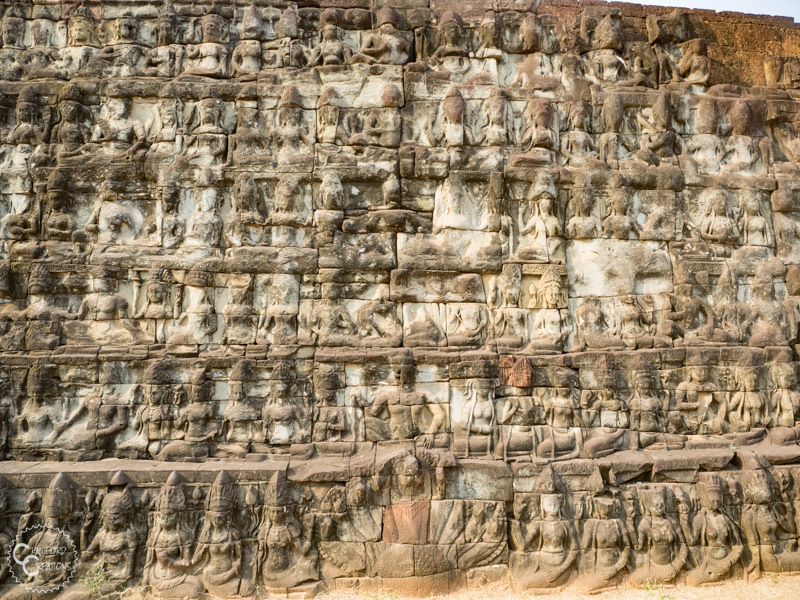 A terrace of which the outer wall is made of stone elephant faces. 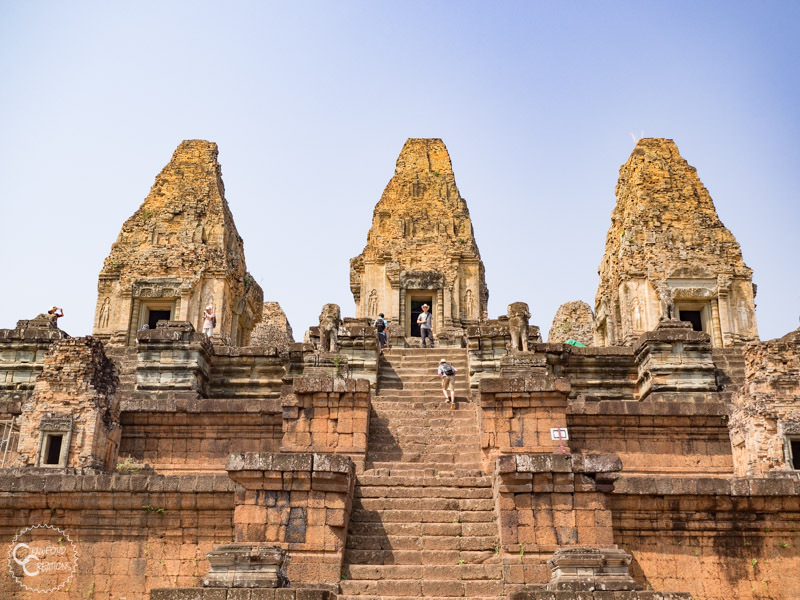 While it’s not a temple, and really not that much fun to explore on its own, it’s actually the entrance to the Royal Palace which houses two incredibly cool temples you definitely need to check out. 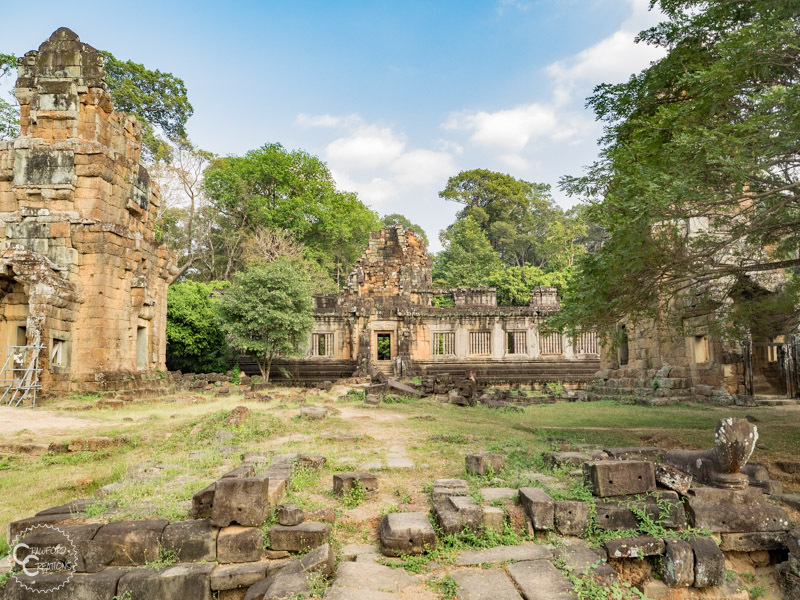 The first of the Royal Palace temples is Phimeanakas. If you can say that name five times fast you’re a serious wordsmith because I can barely even get it out once! 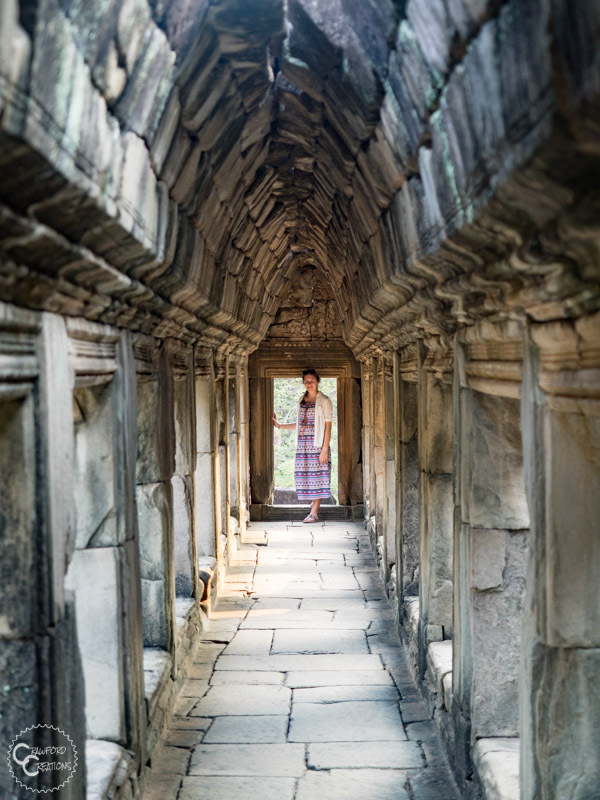 This temple has some of the coolest hallways. 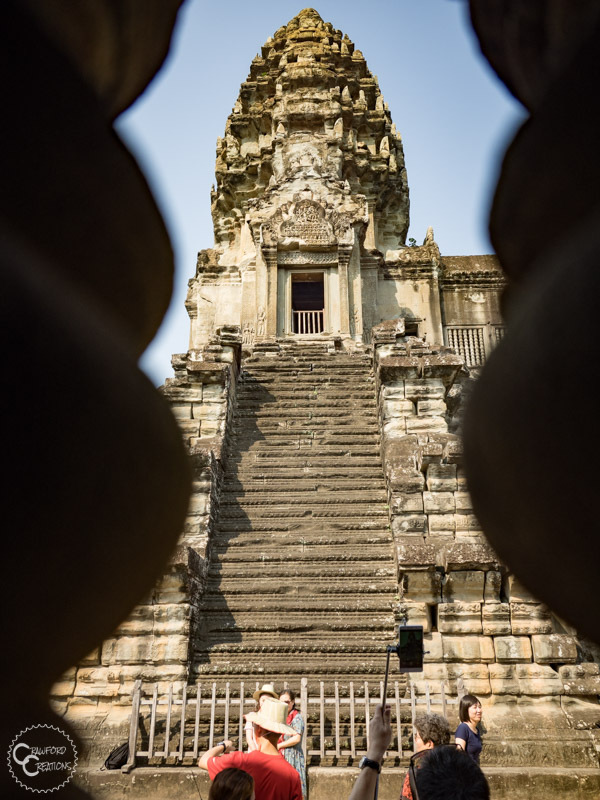 They’re layered snaking up and down the temple and every hallway is lined with square windows. Phimeanakas Temple also happens to be a pretty good place to watch the sunset. The sun goes down behind the temple. 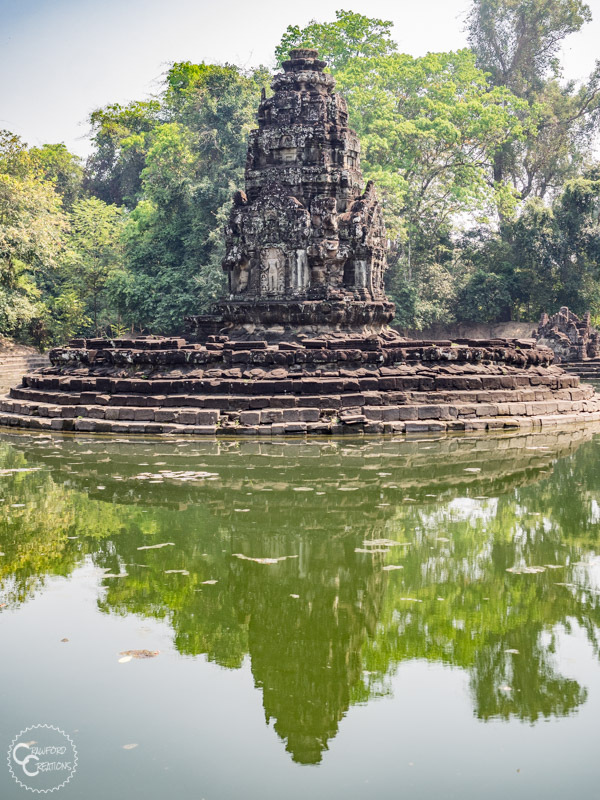 If you head back out to the entrance of Angkor Thom you can also catch a nice sunset reflection on the moat. 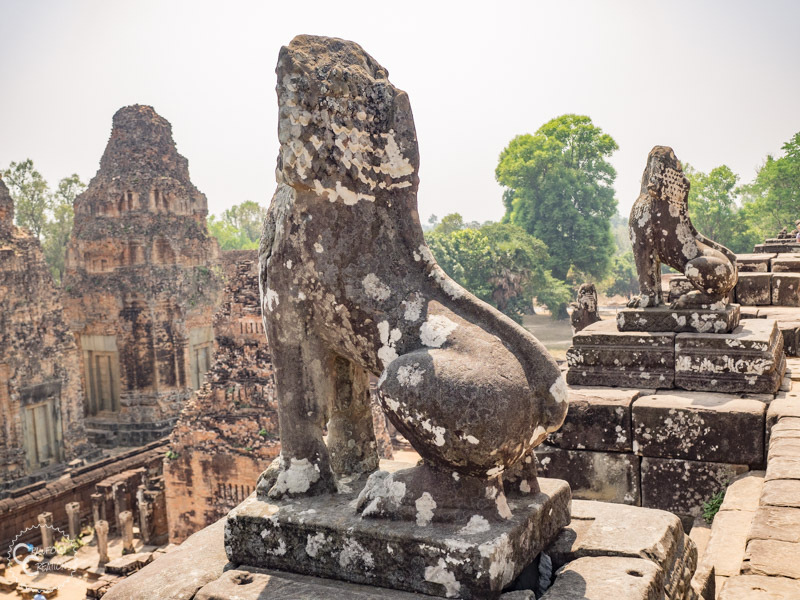 Phimeanakas was the centerpiece of Angkor Wat during King Suryavarman’s rule. 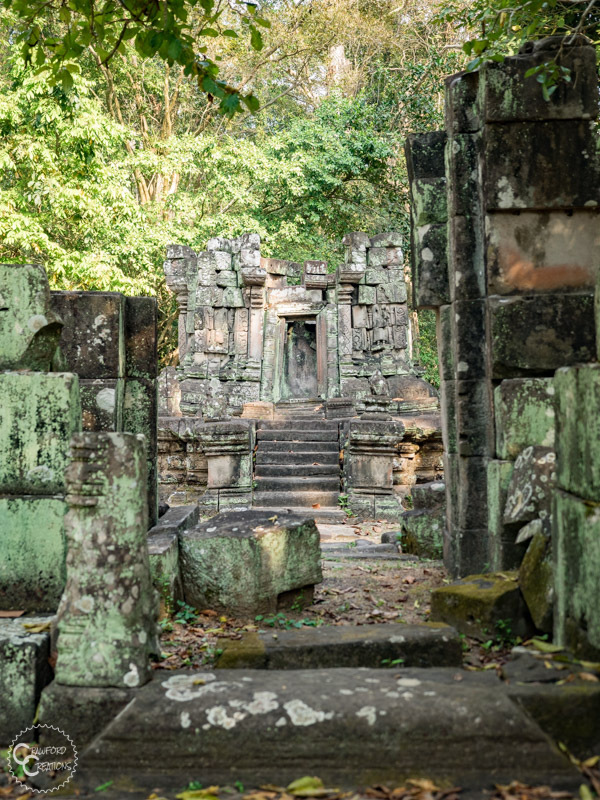 Legend has it that the king spent every night here with a woman who was thought to represent Nagini, the snake goddess. 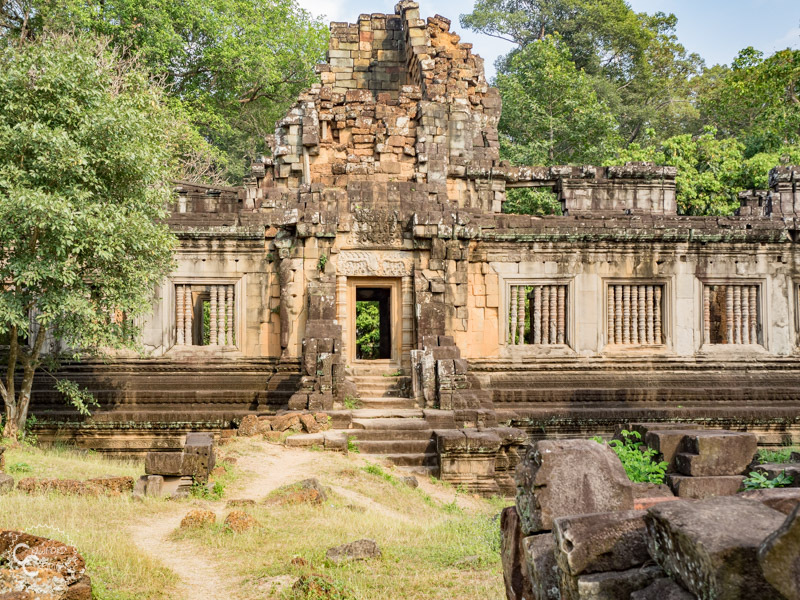 Baphuon temple is located next to Phimeanakas, and if you’re thinking it looks a little wonky, that’s because the entire back (or front, I’m actually not entirely sure) wall of the temple is laid out in the shape of a lying down Buddha. 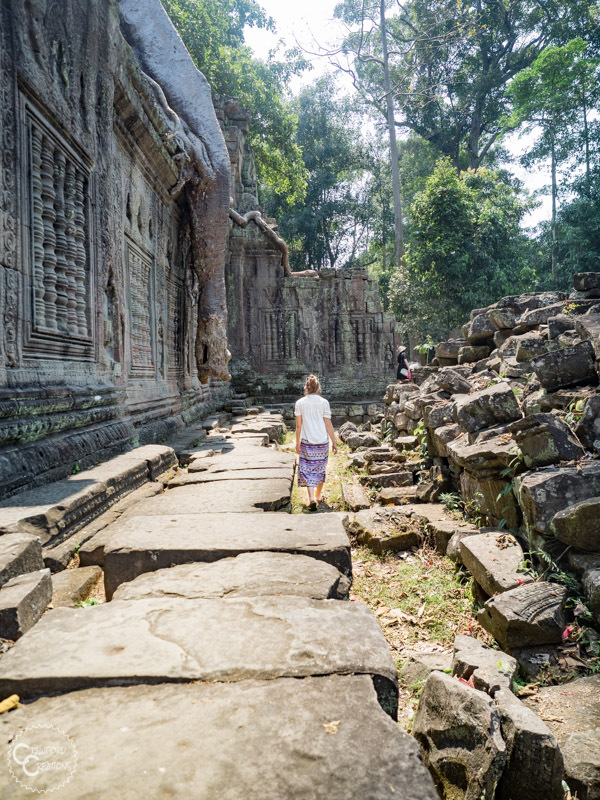 Don’t underestimate the crowds at Angkor Wat. 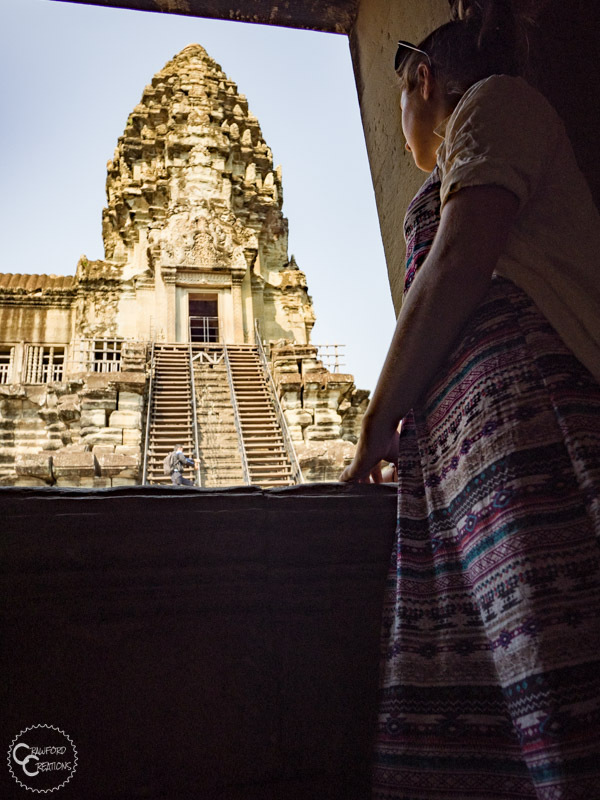 We tried and miserably failed at avoiding the throngs of tourists at Angkor Wat. In fact, every time we rode by the entrance there were always tons of people, which leads us to believe that there are simply just always tons of people. 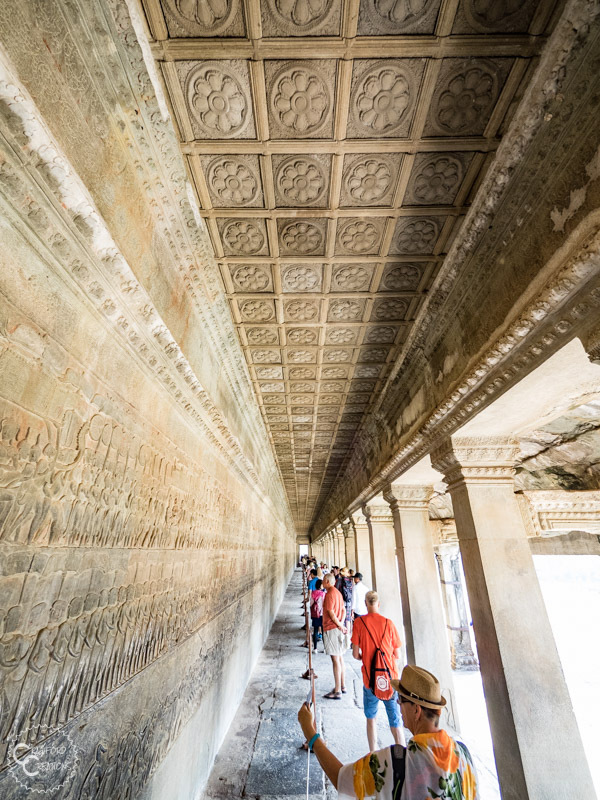 Angkor Wat up close was actually pretty unimpressive, with the exception of this wall. 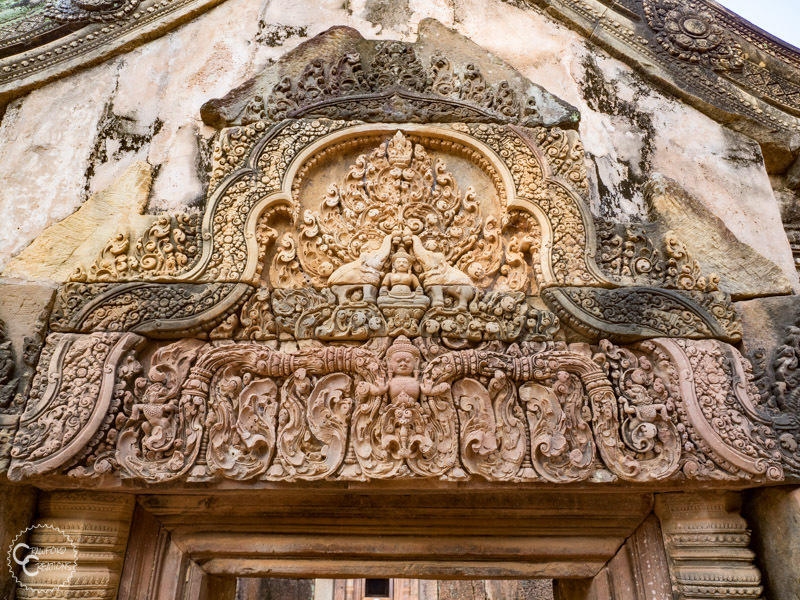 One of the inner walls around Angkor Wat is super intricately carved with reliefs depicting a battle of the Gods that ultimately ends in the creation of the universe. It’s actually pretty cool, so naturally, it’s crowded with tour groups. Sometimes you have to throw your creative originality out the window, and this was one of those times for me. 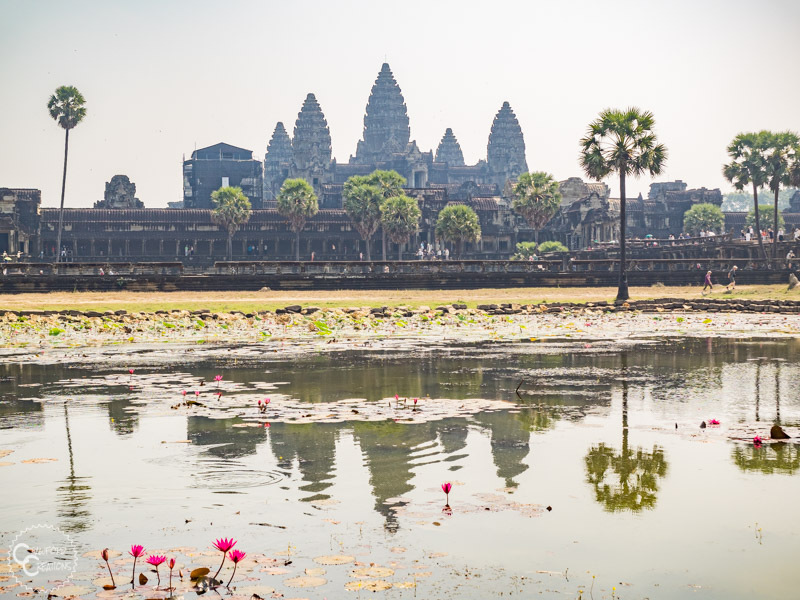 I simply couldn’t leave Angkor Wat without snapping this classic photo at the reflection pool! Behind The Shot: While it looks like there’s no one around, behind and to the sides of me are actually dozens of my closest friends, all vying for the same shot. 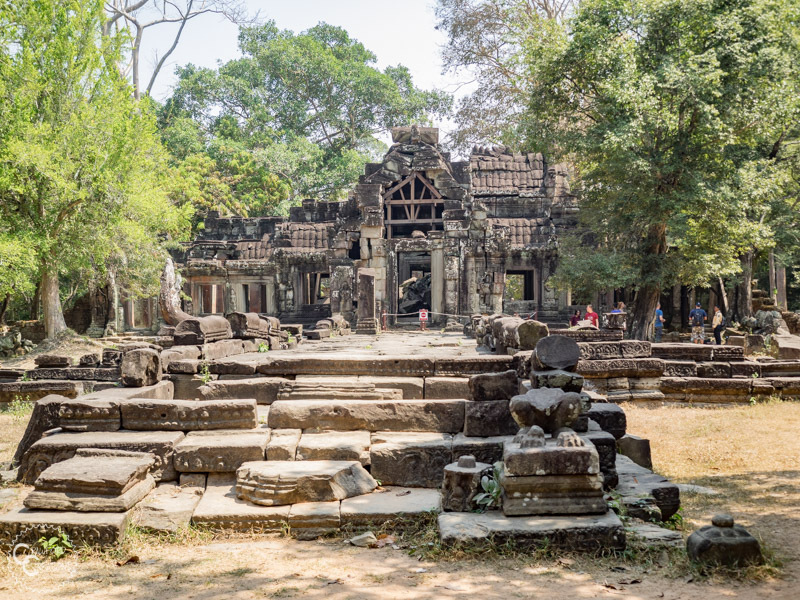 Preah Khan seemed to go on forever. We walked through doorway after doorway, meandering down a seemingly endless hallway. Every doorway has a sort of threshold to step over before entering the next section. 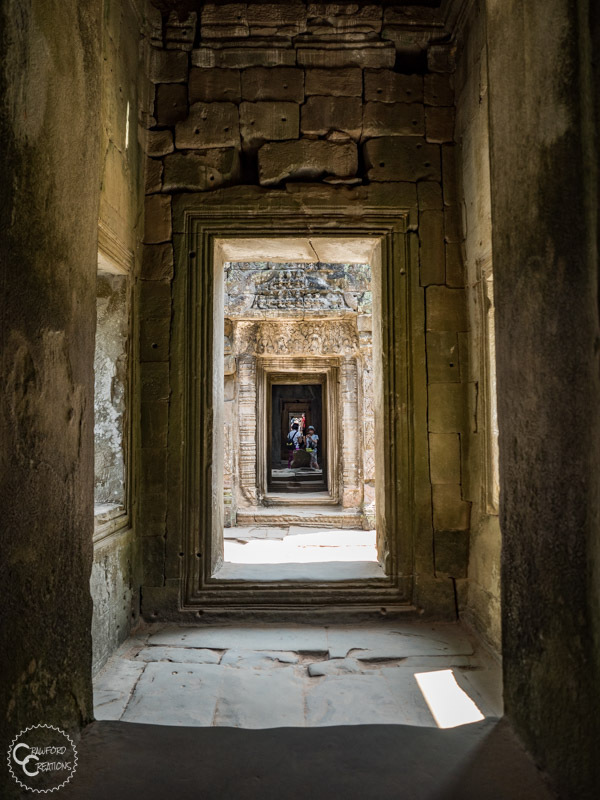 The thresholds are built to keep the evil spirits from entering the room and should be stepped over and not on so as not to damage the barrier. 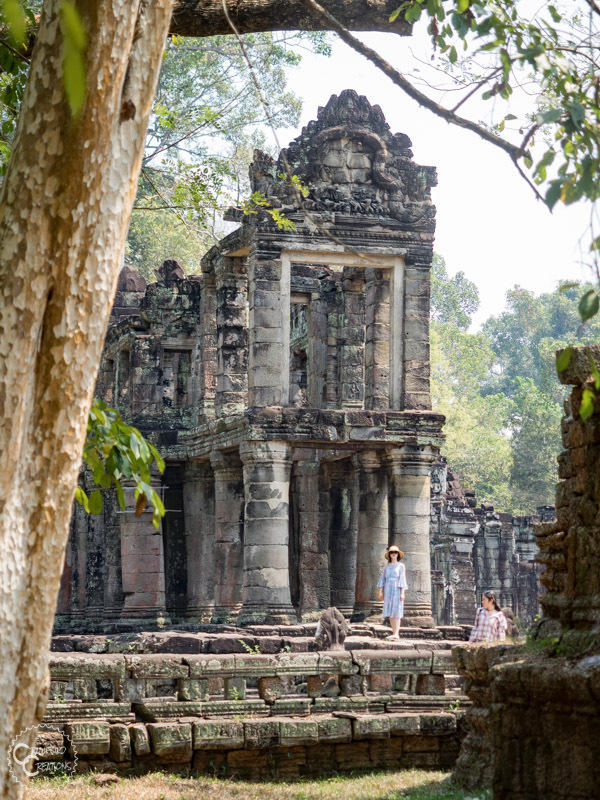 I’m not exactly sure if that tradition is still followed by the locals in these ancient ruins, but I kind of hope not because I seem to remember us stepping on a couple of them…ignorant tourists party of two. 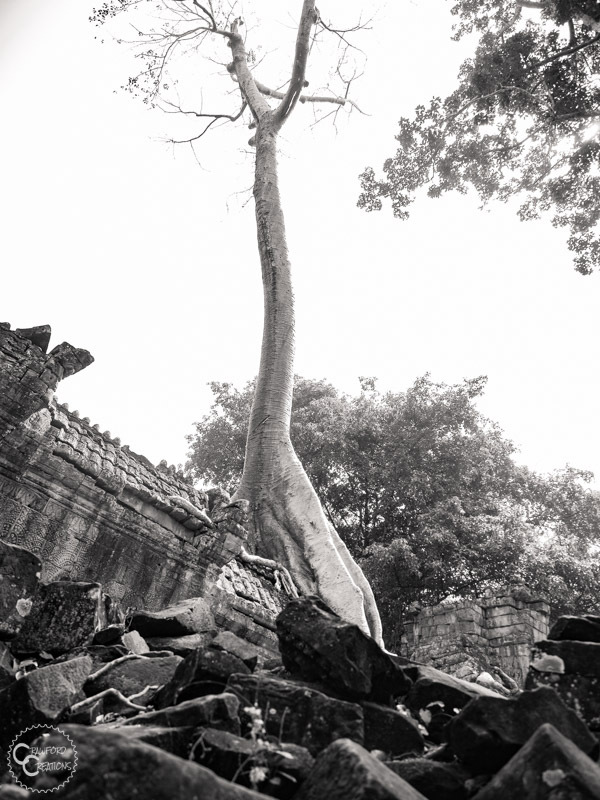 Walking out the back of the temple we were surprised to see this huge tree sprouting straight out of the top of the building. 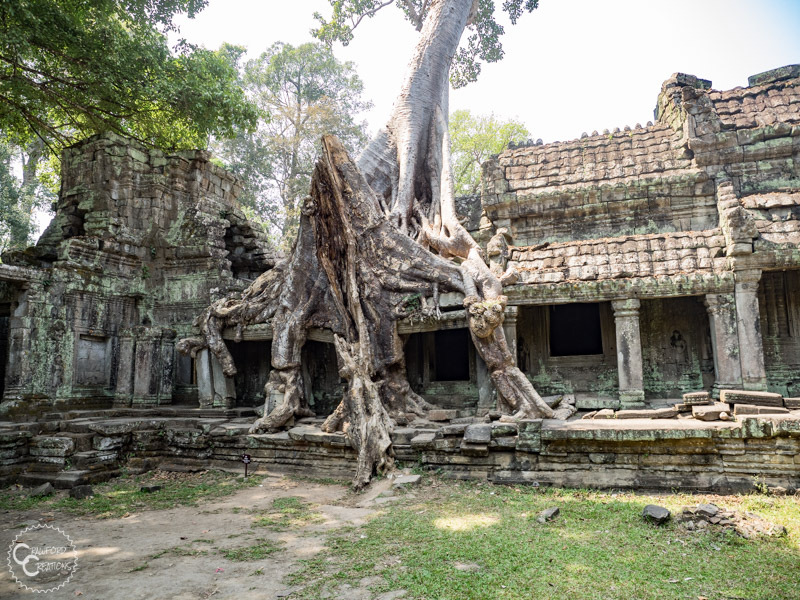 I thought Ta Prohm was the only temple with trees growing out of it, but I’m so glad I was wrong. 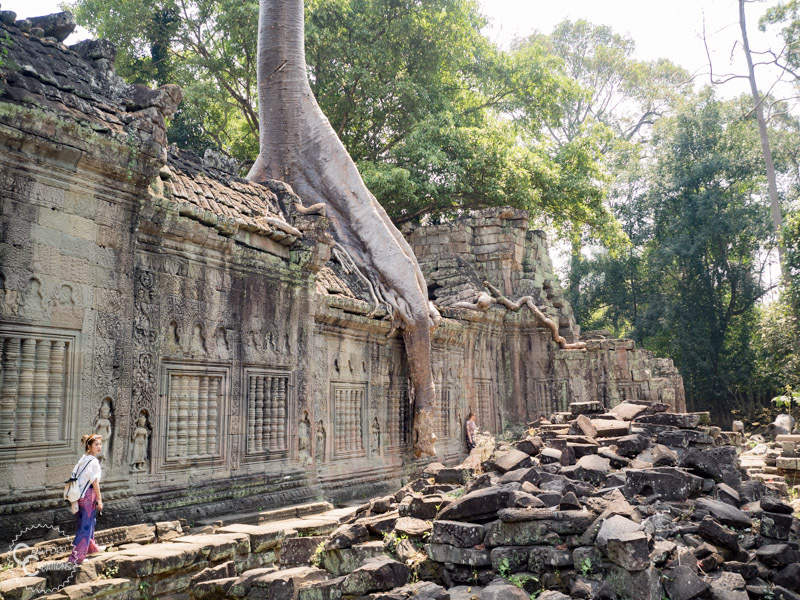 It’s so cool to see nature taking back the city like this! Behind The Shot: This is a pretty popular photo spot. To get this shot I waited patiently for a break in the line and snapped this in the few seconds when one person left and the next in line hadn’t made it into frame yet. 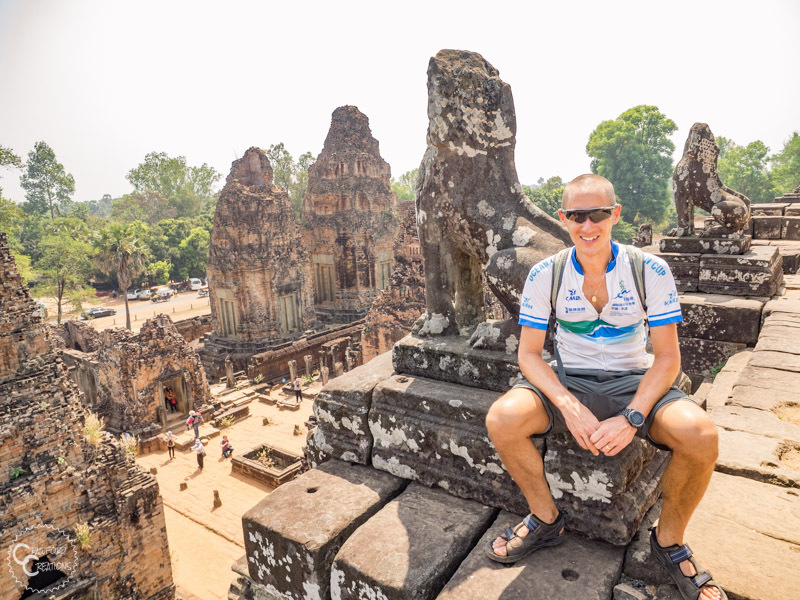 This really cool tower of columns is located right beside Preah Khan temple. I guess it’s some sort of annex. This building was definitely built in a different style than the temple itself. It almost looks Roman with those rounded columns. 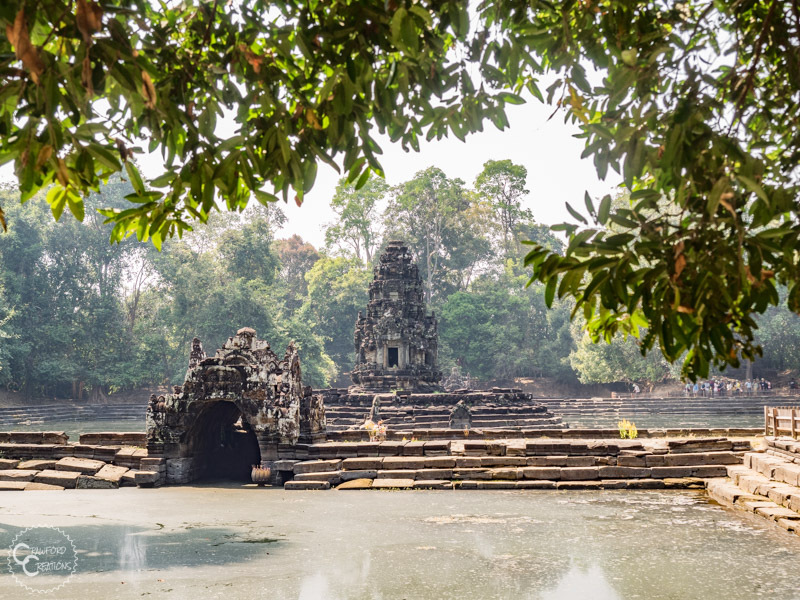 While most of the temples have moats around them, Neak Poan is the only temple that is actually built over water. The temple is located in the middle of a pool, which makes for some great reflection shots! You actually have to walk across a boardwalk over a wetland marsh just to get to this place. 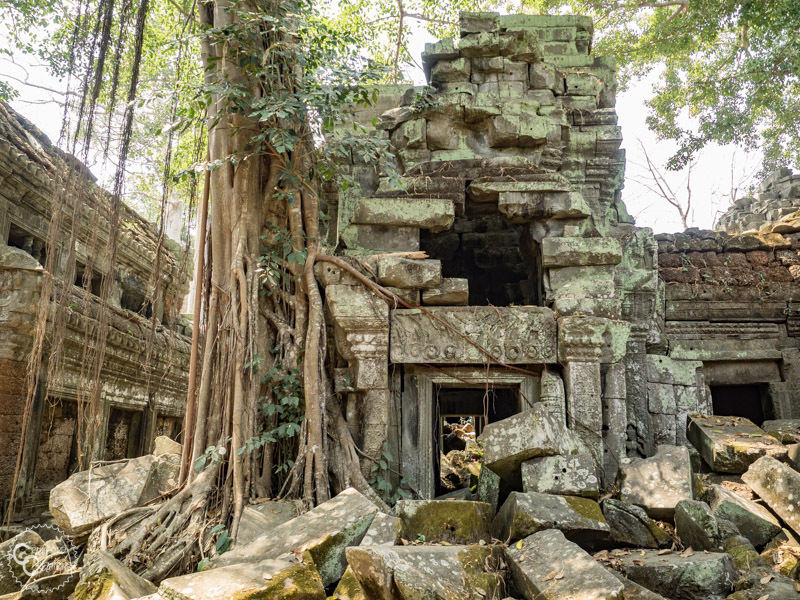 Ta Som is a pretty small temple, but what it lacks in size it makes up for in giant trees! 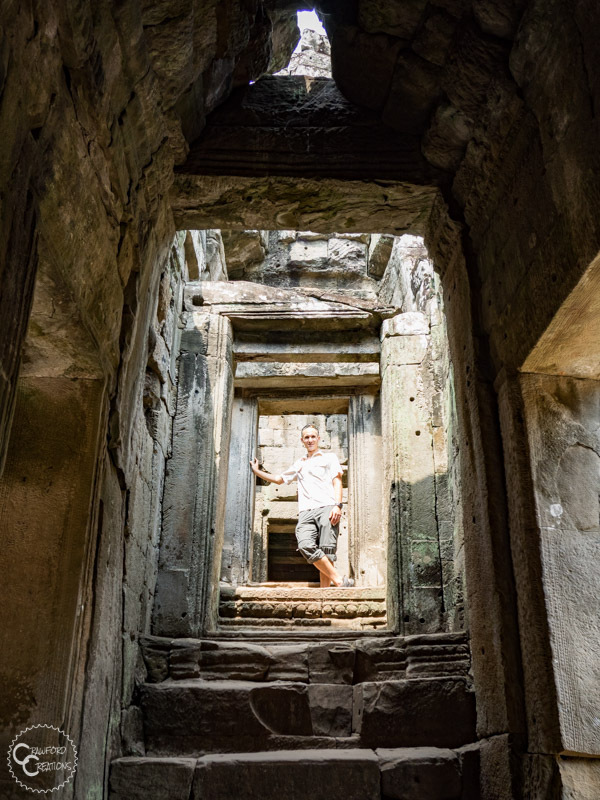 The back exit of Ta Som is basically the coolest thing I’ve ever seen. Nature power at it’s finest! 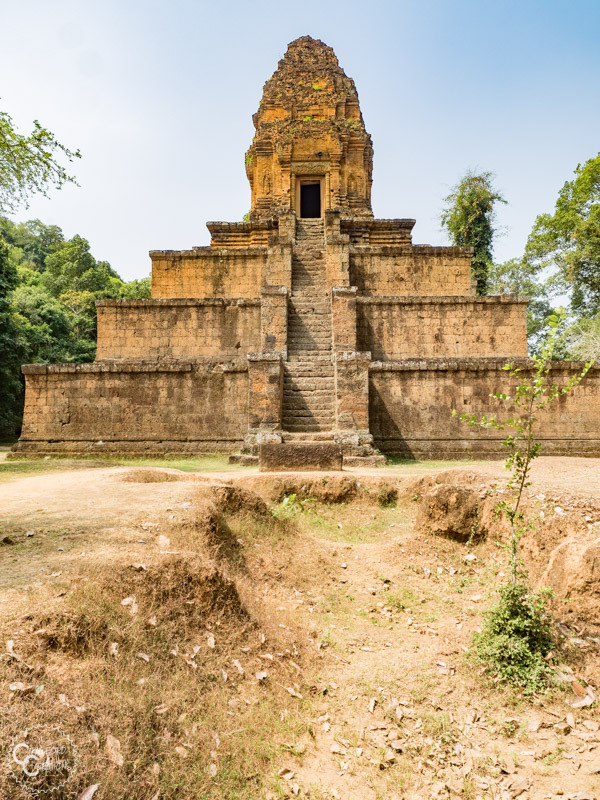 East Mebon was the first brick temple we visited. 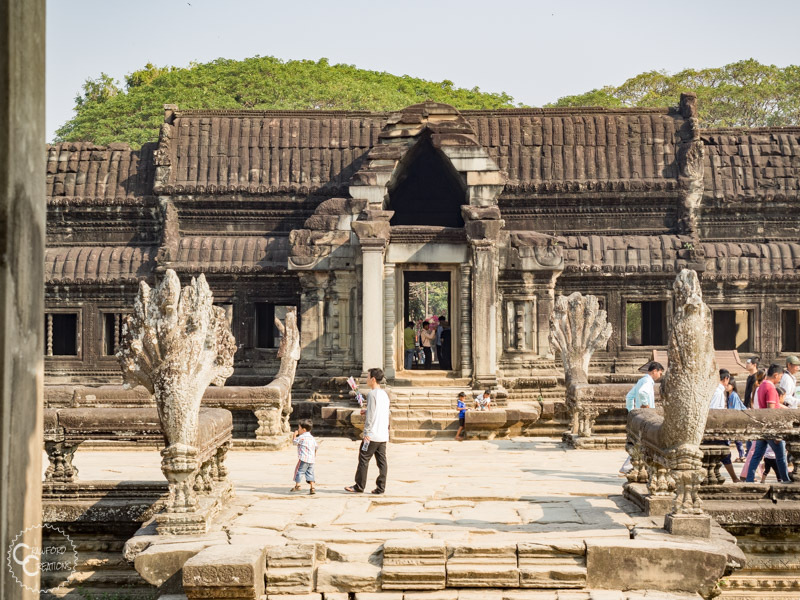 Because of this it definitely has a different look and feel than the other stone temples. 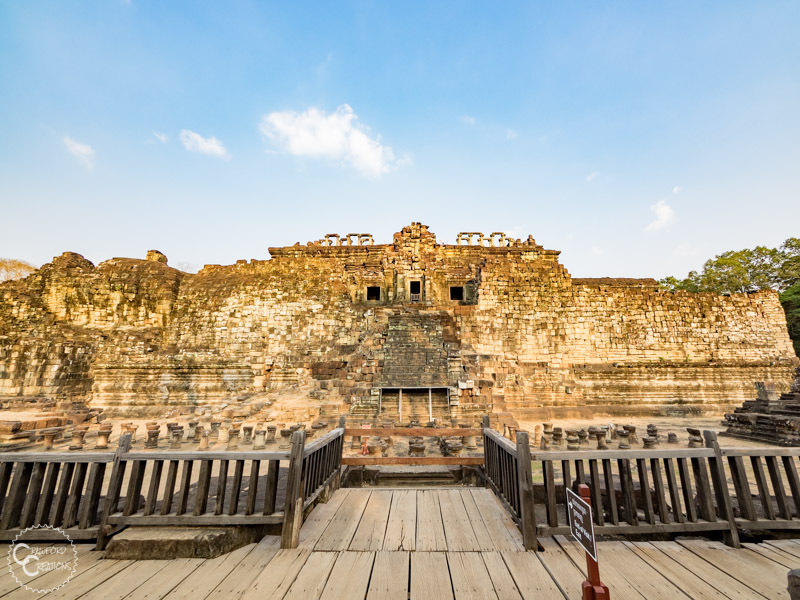 The brick also limits carving ability so East Mebon is much plainer looking than a lot of the other temples. 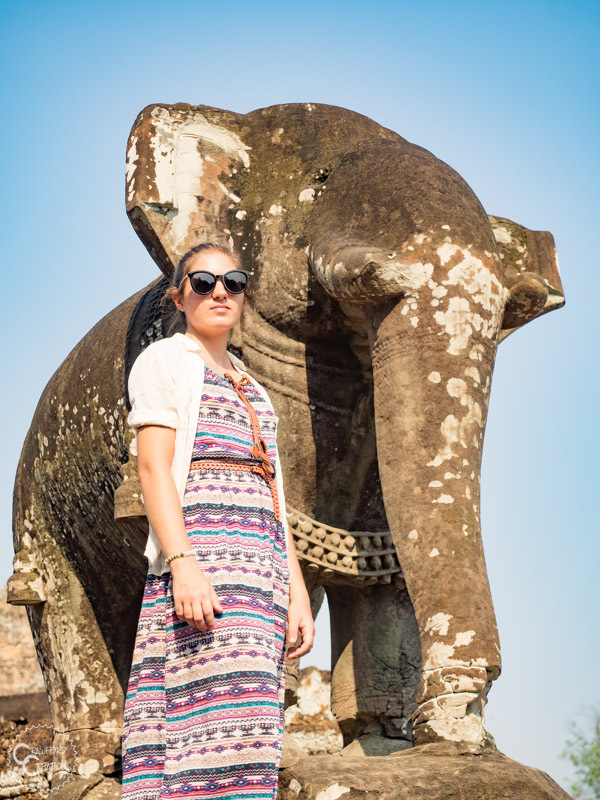 It does have some awesome elephant statues though, much bigger than the ones at Elephant Terrace. 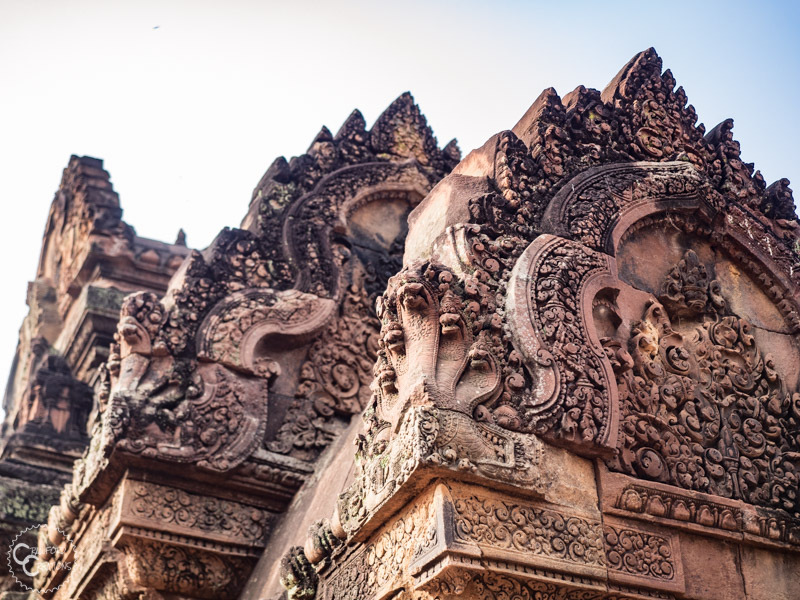 Banteay Srei turned out to be one of our absolute favorite temples. And to think we were debating whether or not to even pay it a visit! 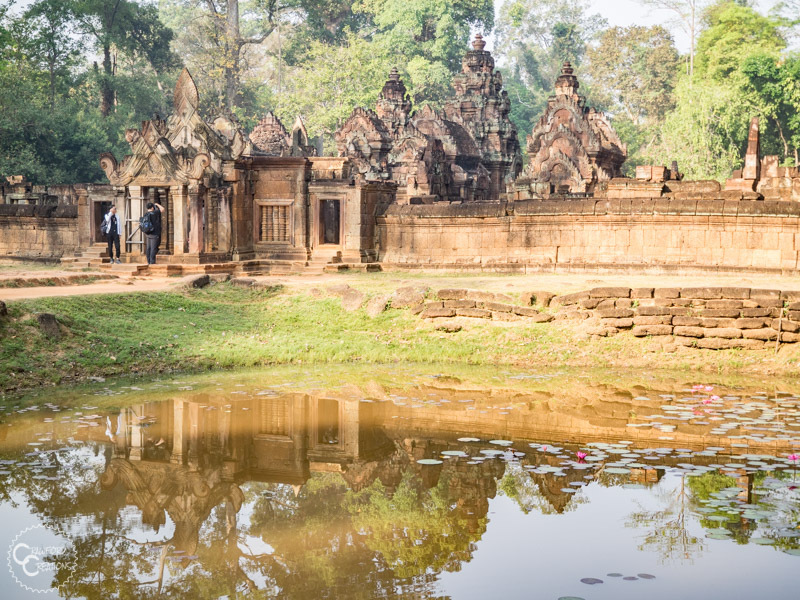 Banteay Srei is located 30 kilometers north of Siem Reap and is included in your Angkor Wat ticket. 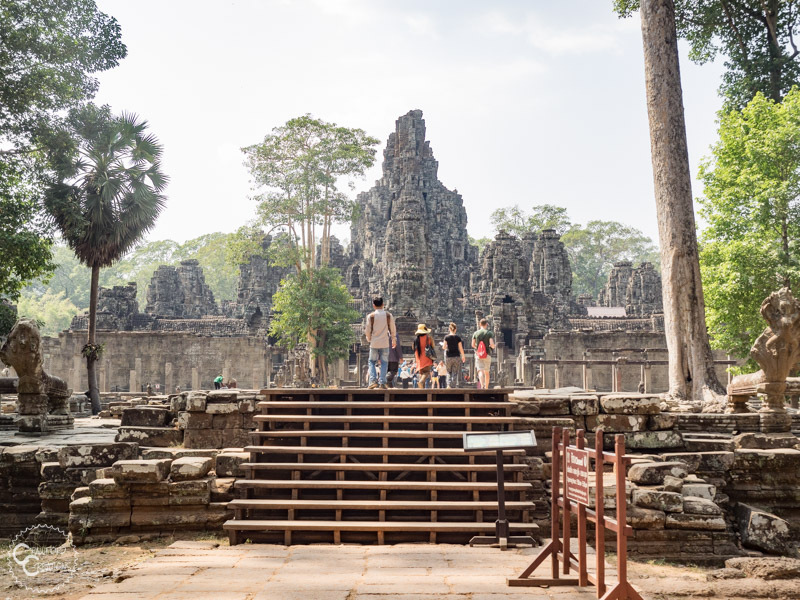 While this means you don’t have to pay an entrance fee it also means you will use up one day on your Angkor Wat pass visiting this temple, so we had to make sure we combined our visit here with the remaining Angkor Wat temples we wanted to see in Siem Reap. 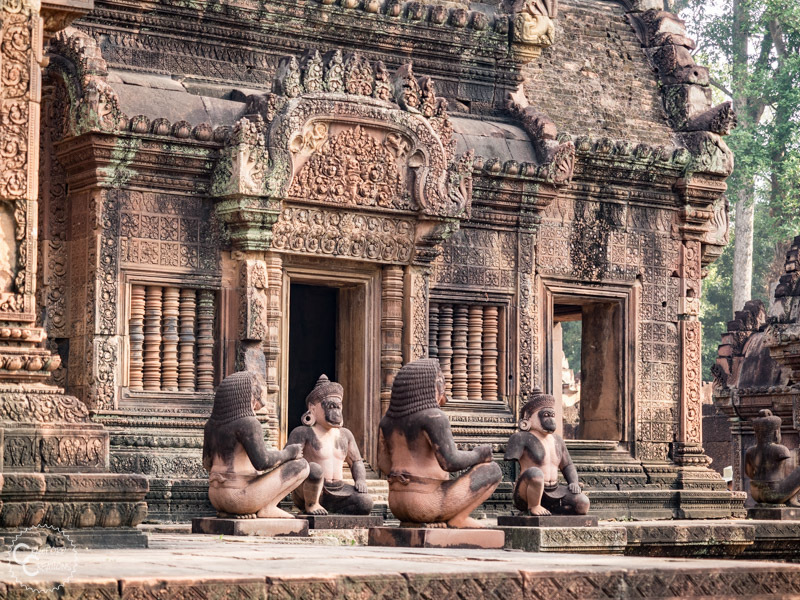 Banteay Srei also goes by two nicknames, the Pink Temple and the Tiny Temple. 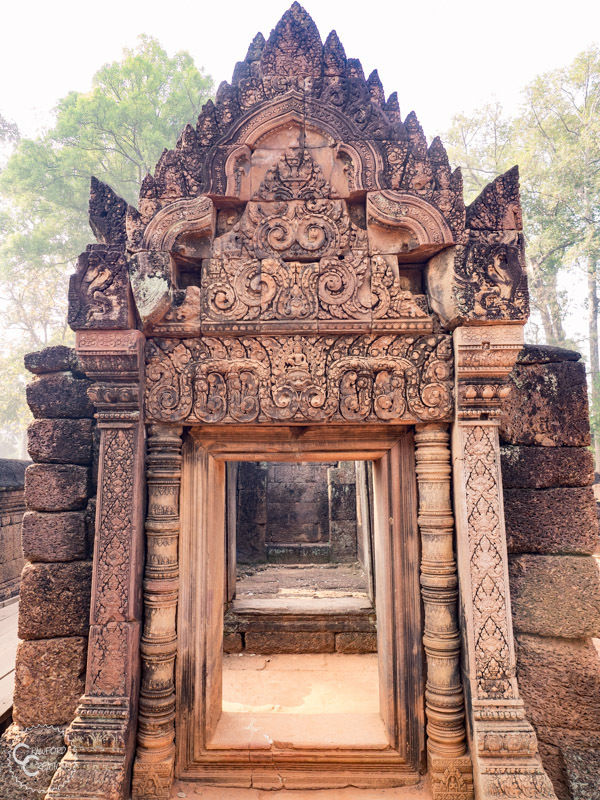 The name Pink Temple refers to Banteay Srei’s pink color, which it gets from red sandstone. 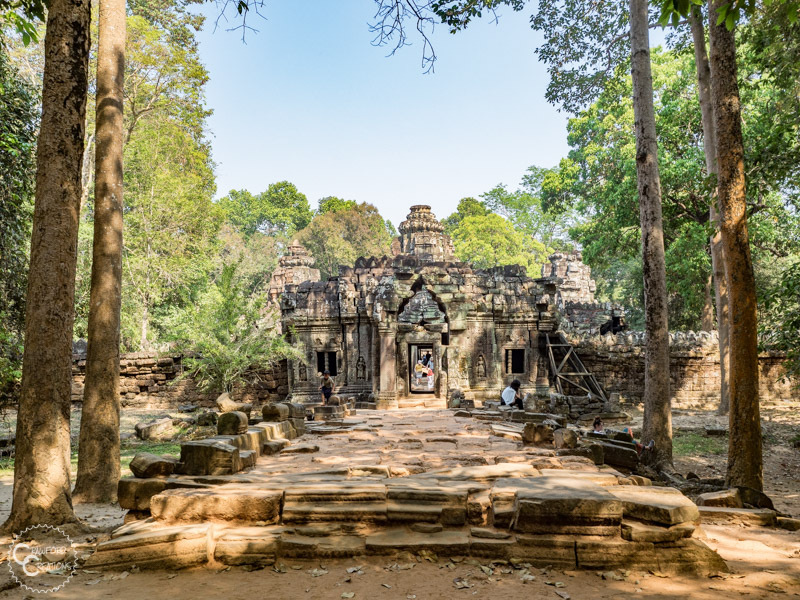 The name Tiny Temple refers to the unusually small size of Banteay Srei’s buildings, which, when compared to the other Angkor Era temples, look like they were built in miniature. 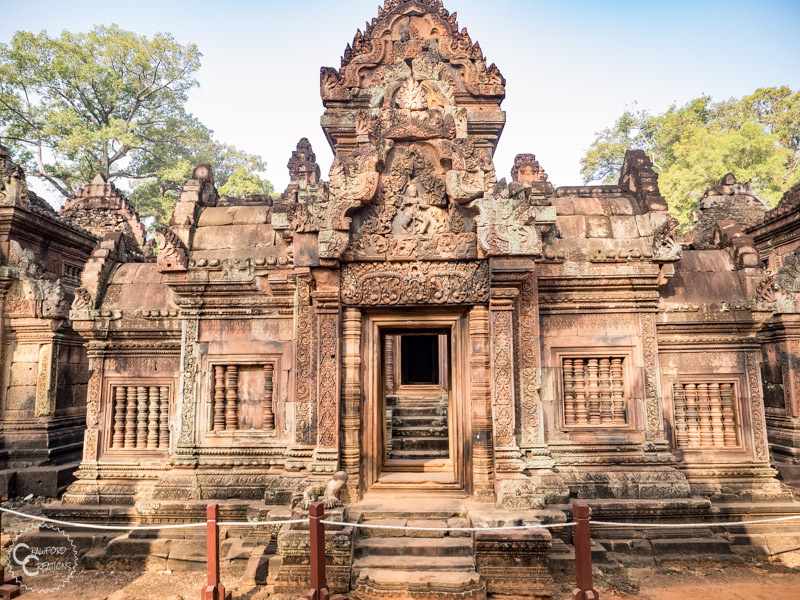 The red sandstone make-up of Banteay Srei is extremely amenable to carving, and the Cambodian’s definitely made use of that feature. 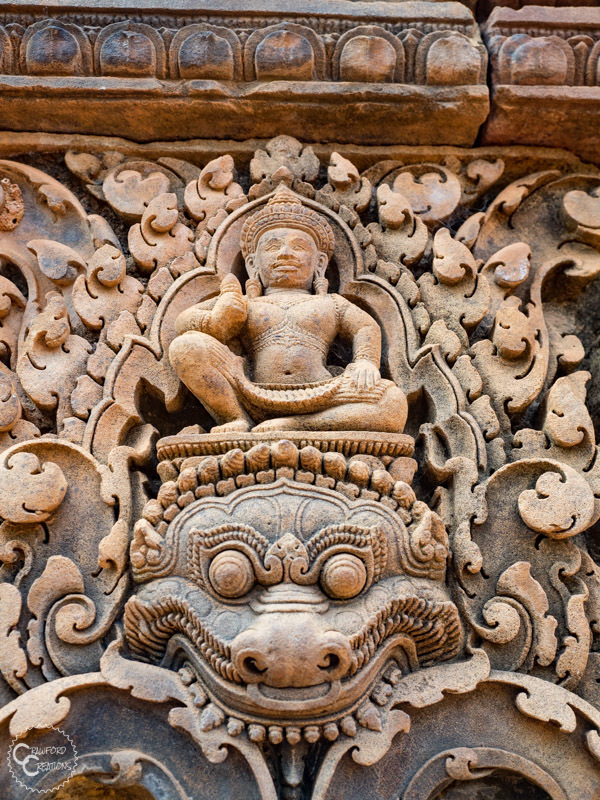 It seems like every inch of Banteay Srei is carved in intricate detail. 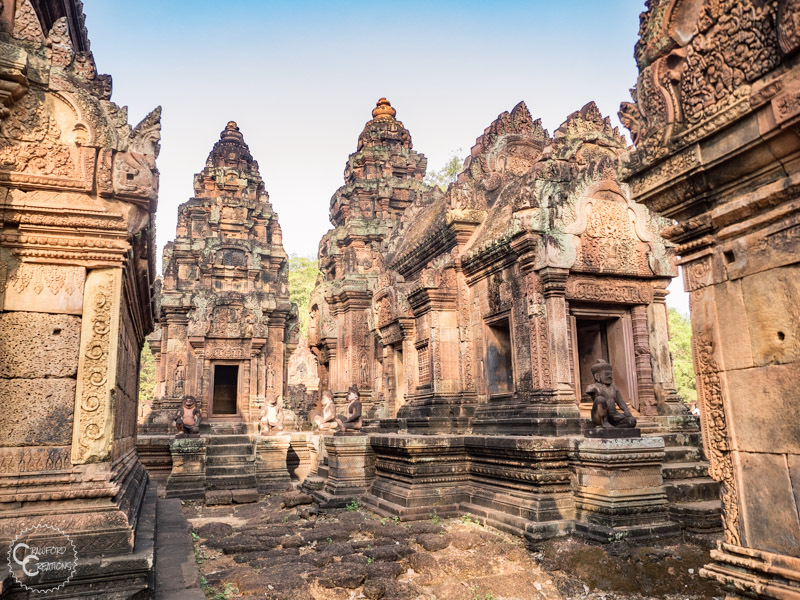 This temple is truly a work of art! 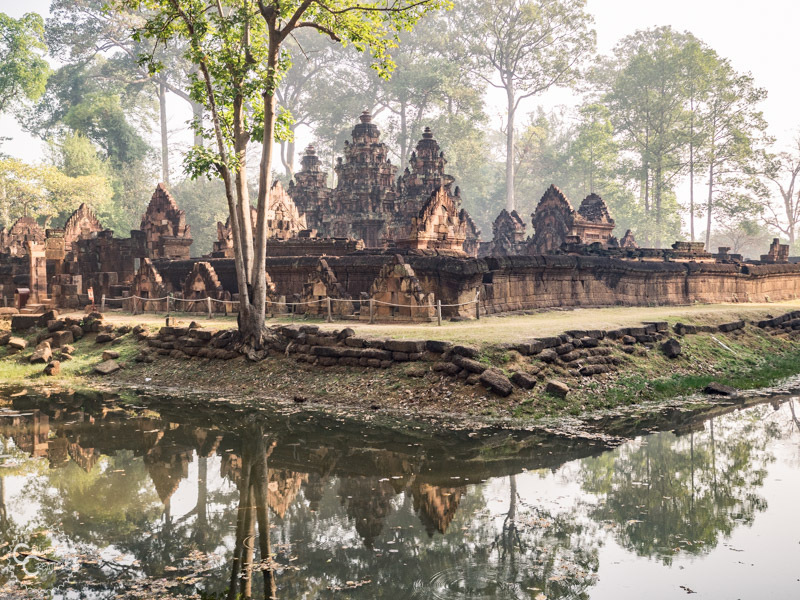 Like a lot of the other Angkor Wat temples, Banteay Srei is also surrounded by a moat, which makes for some incredible reflections! This photo was taken early in the morning when the sun was still low in the sky. 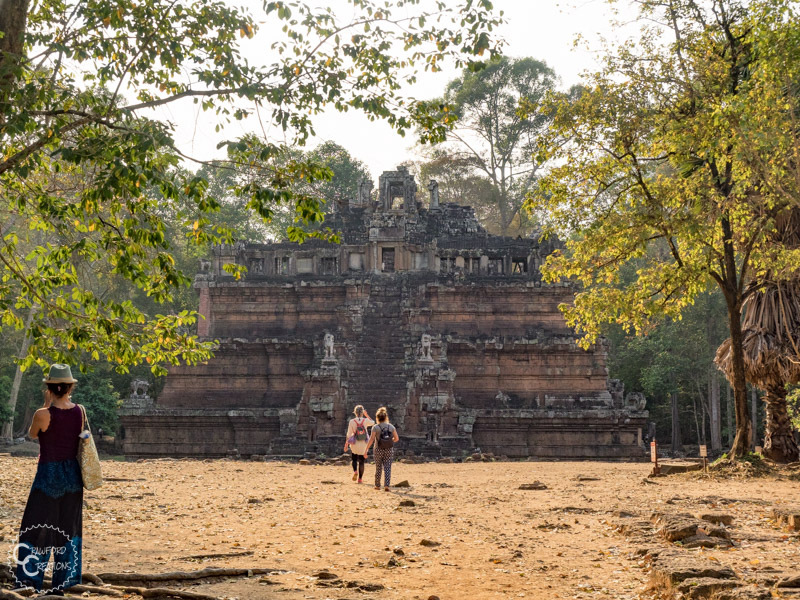 I would definitely recommend getting to Banteay Srei shortly after the temple opens at 7:30 am, not just for the photogenic light, but also to avoid the tour buses full of people that start rolling in come about 9:30. 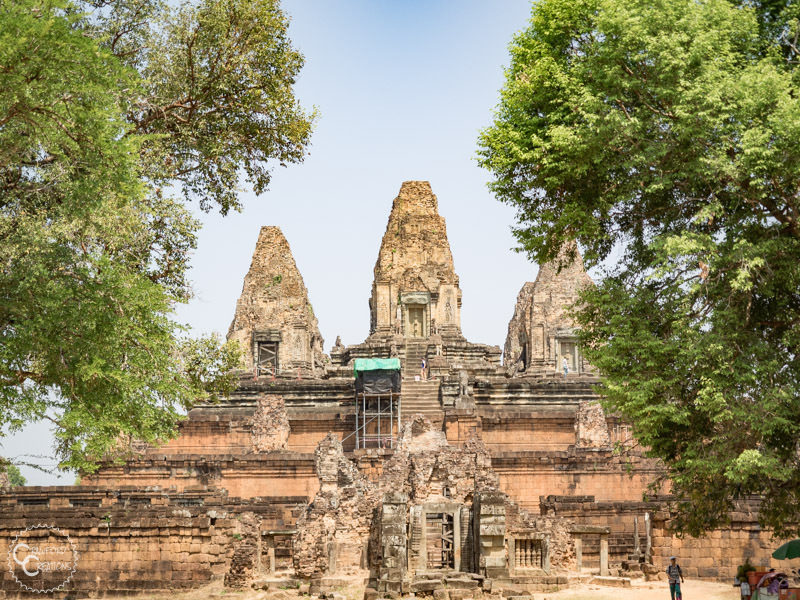 Pre Rup is another temple that’s rather unique in makeup. 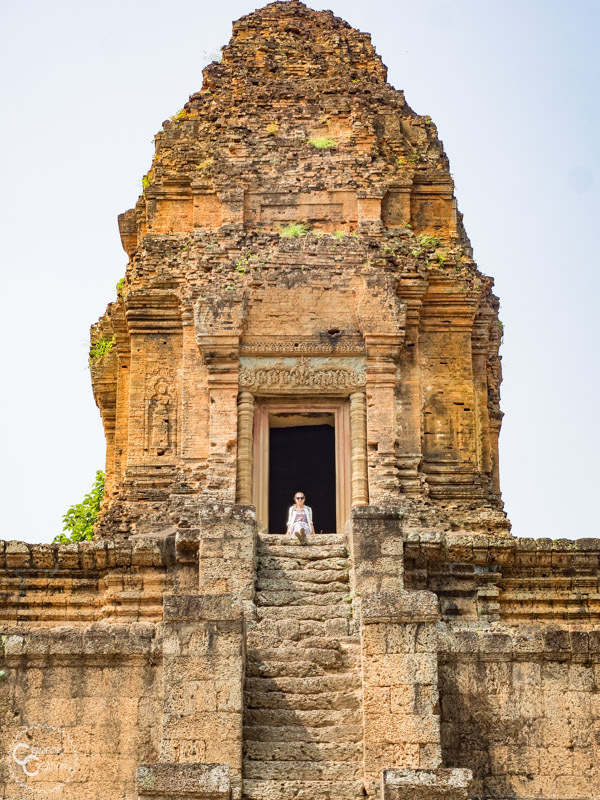 It’s made of both stone and brick and is much bigger and more open in design than a lot of the other temples. 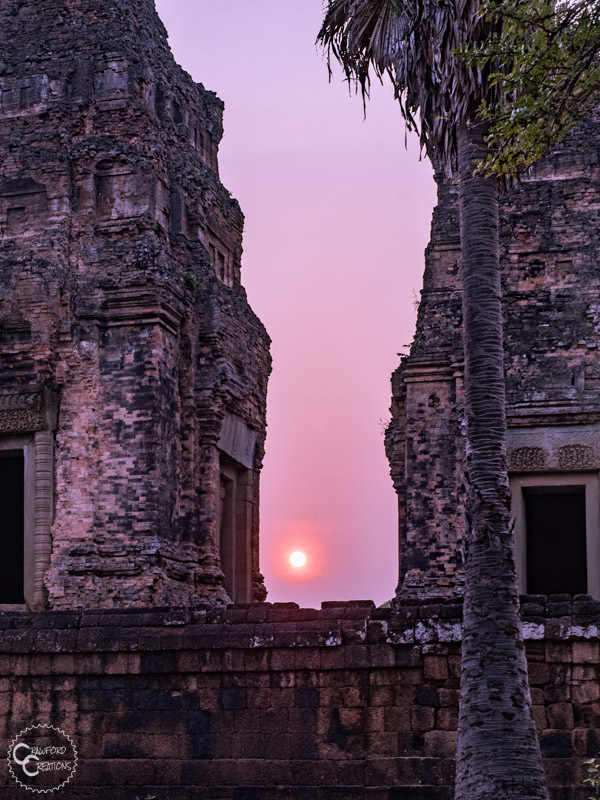 But the best part about Pre Rup is that the sun sets right in between two of the towers, making for an epic and beautiful sunset view. 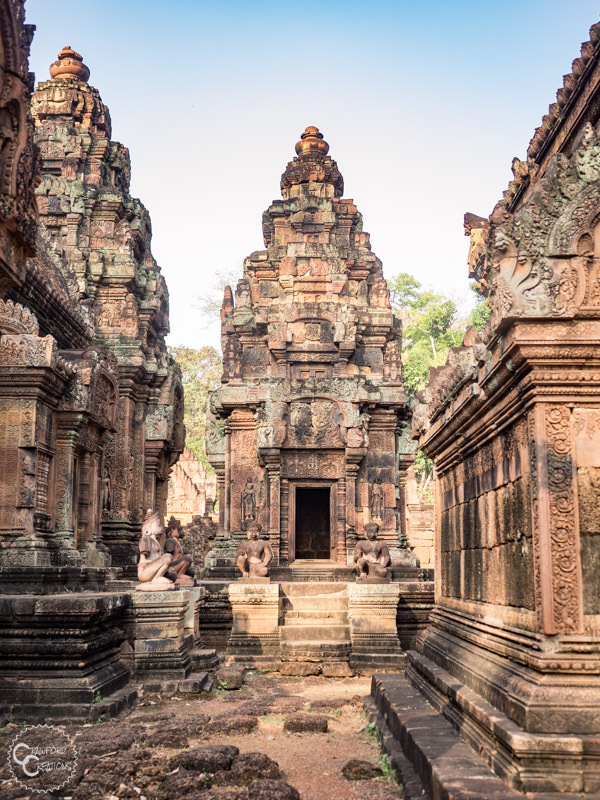 Banteay Kdei is kind of like a mini Angkor Wat with its pinecone shaped towers. 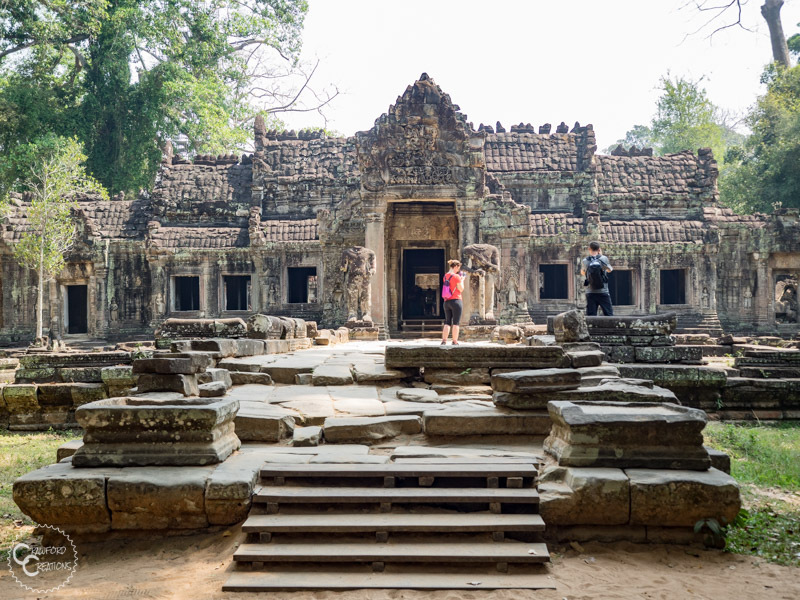 We really enjoyed wandering around Banteay Kdei. 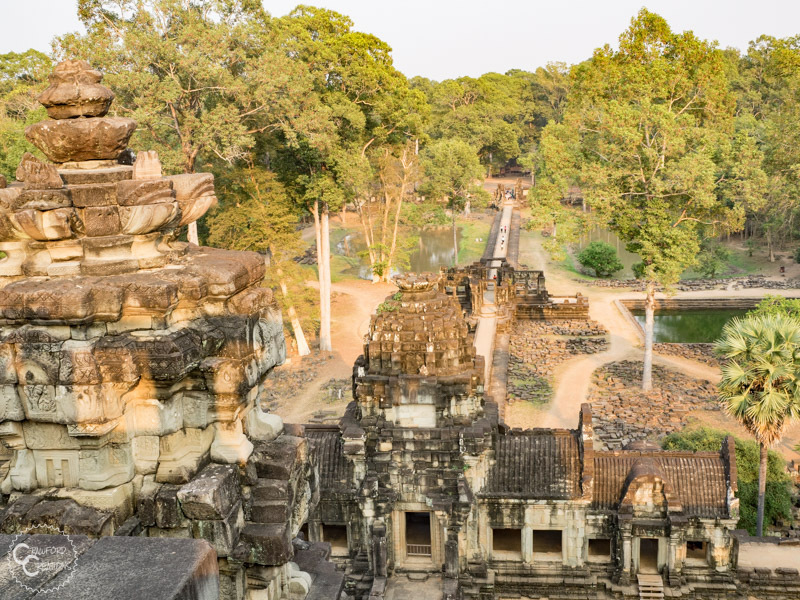 It’s surrounded by jungle, but not overtaken by it, and has the shape of Angkor Wat without the tourists. 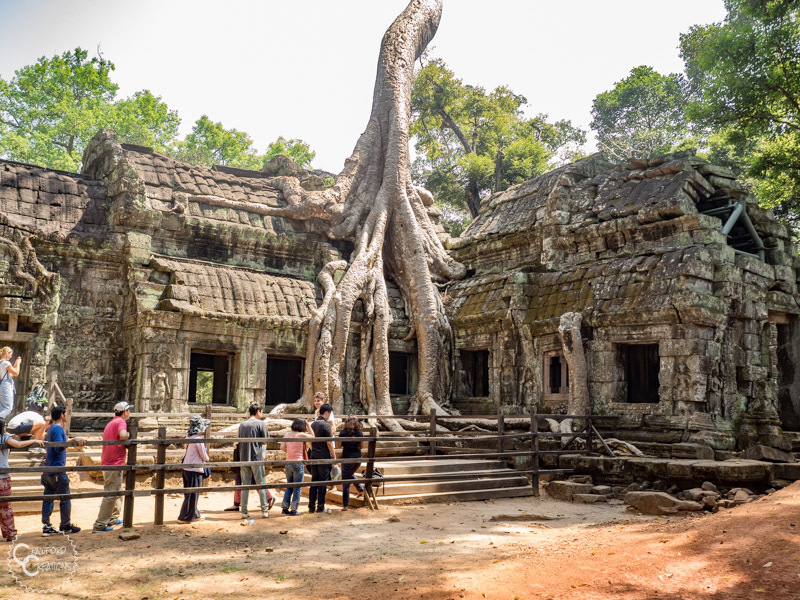 Oh the famous Ta Prohm. 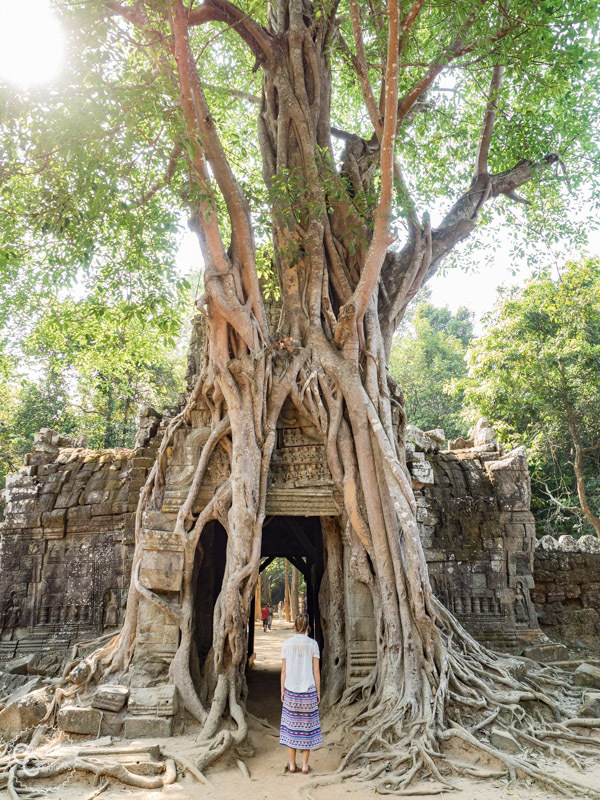 This is the line you have to stand in to get a photo next to that tree sprouting out of the temple. 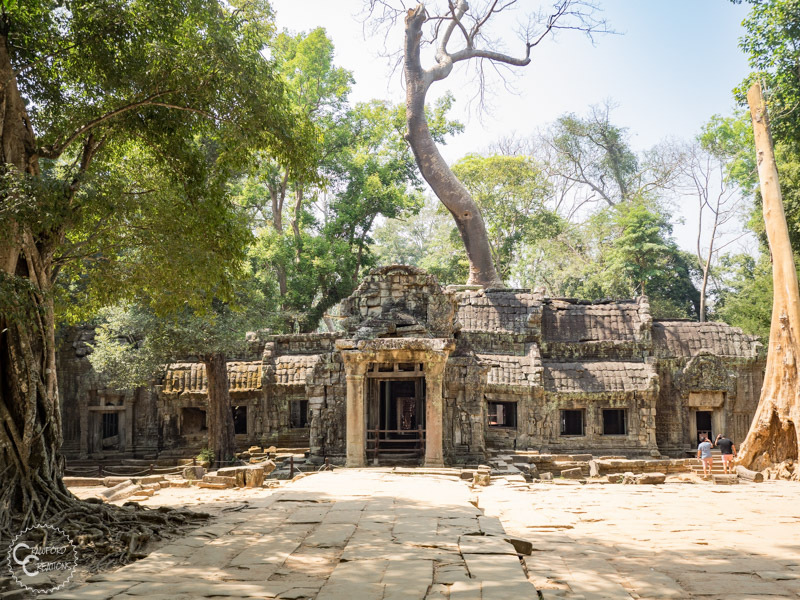 We can thank the movie Tomb Raider for some of Ta Prohm’s crowds, but despite the tourists we actually felt like Ta Prohm held up to its famous reputation. We went later in the day so I think that might have helped to avoid the major groups of tourists. 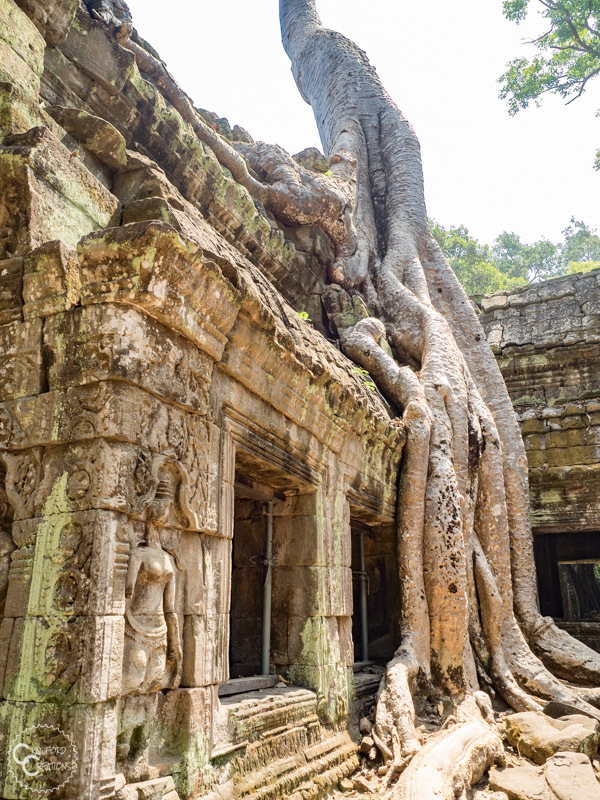 Ta Prohm is definitely the Angkor Wat temple most overtaken by jungle. 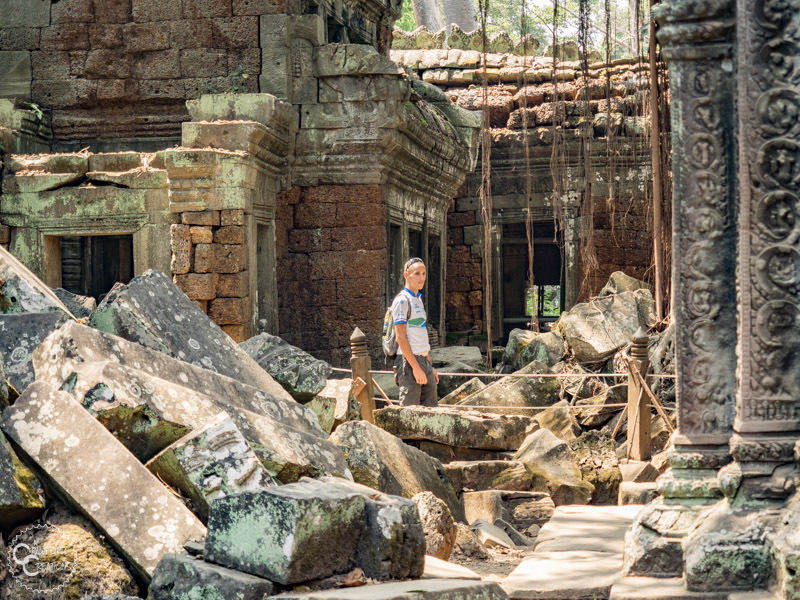 It’s also one of the most ruined temples we saw. Restoration work was underway when we visited and they had the center building roped off with workers recarving the stone walls. Having the workers there really made me feel like I was on the set of Tomb Raider. All that was missing were a few famous actors!